Pre Trip/Planning and getting organized. As we finished up our paddle on the Sea of Cortez, our thoughts began to turn northward. 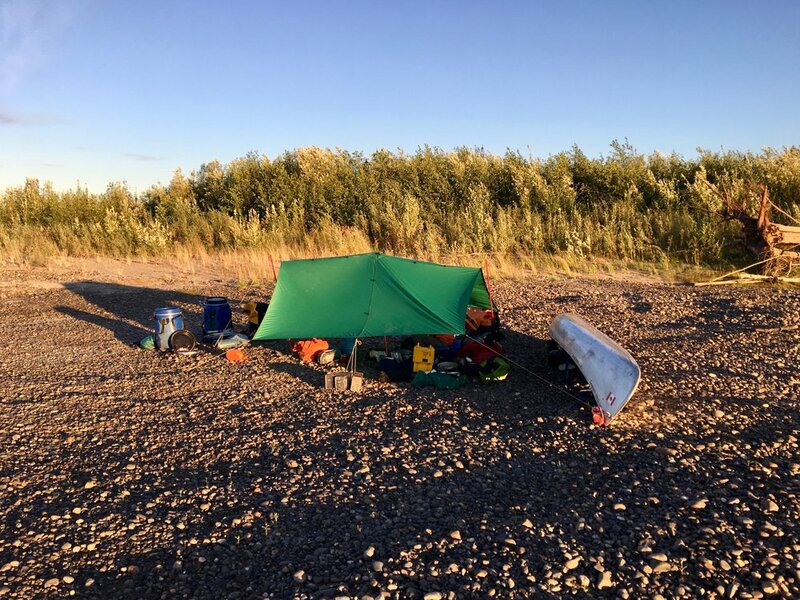 The summer of 2017 was slated to continue our journey of hiking the Chilkoot trail and then paddling the Yukon River to the Bering Sea. It had been two years since we saw our property in Alaska and we were excited to be heading home. First though we were fortunate enough to visit our son Jeff in Portland and we squeezed our 5 pieces of luggage in to his car. We arrived to Alaska on the 23rd of April. There was still snow on the fields and the leaves had not come out yet. The mountains are as beautiful as ever and it feels good to be back in Alaska. Alaska can take your breathe away! 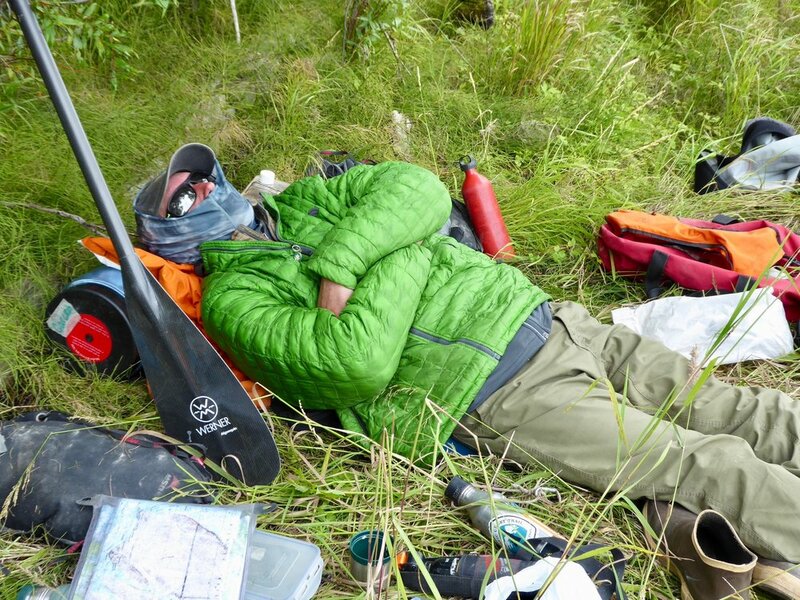 We had planned a month of full on Yukon prep work along with getting ready to work a NOLS course. For a while it looked like there might be too much on our plate. It was a good thing that the days are getting longer. One of the big projects was getting the food ready. Playing it safe we estimated that we could be on the river for 70 days. From our reading about the river it was apparent that we should plan on taking most of our food with us. One could not depend on getting enough food at the smaller villages I cooked and dried most of our meals for the trip. Time consuming now, but would pay off later. Other major tasks were getting gear ready and figuring out how we were going to get our boat, gear and us back to Palmer. A friend suggested that we should check out one way Uhaul rentals. 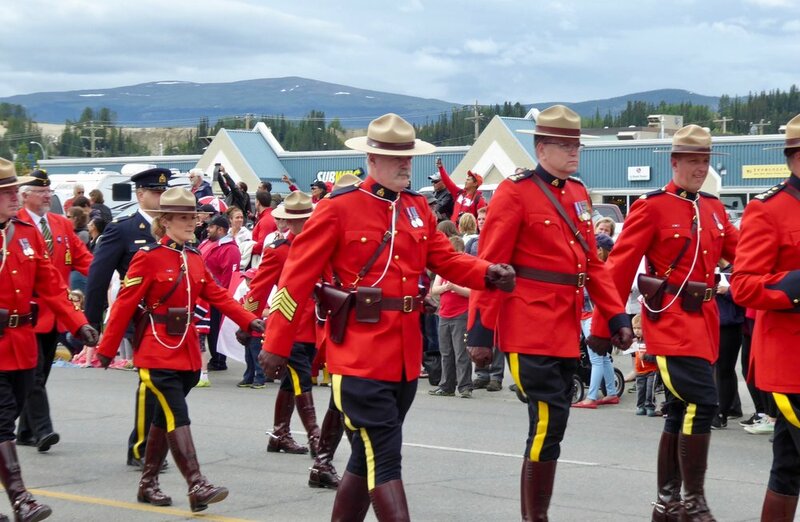 It was a great lead and soon we had reserved a 22 foot truck to drive to Whitehorse. Gear prep included outfitting our canoe with a spray deck and making sure all of our camping gear was in good shape. We still had a month before our departure, but most of the upcoming month included instructing a NOLS course in Prince William Sound. We were surprised at all the snow which made for some cold paddling days. The days went quickly and soon the course was over and we were back at our place and putting on the final touches for our expedition. One major project was boxing up our food to be sent to two of the smaller towns on the Yukon River. Our friends volunteered to send the boxes when we would be getting close to the town. Two days after our course ended we were packed and ready to go get the UHaul. In order to fit our canoe we had to get a 22 foot truck. Needless to say we had plenty of room in the back! The UHaul was a one way only which meant that we did not have to return to Whitehorse when we finished our journey. All of our backpacking gear and canoeing gear fits in the canoe with plenty of room to spare. Our first night found us in Tok about a 350 mile drive. 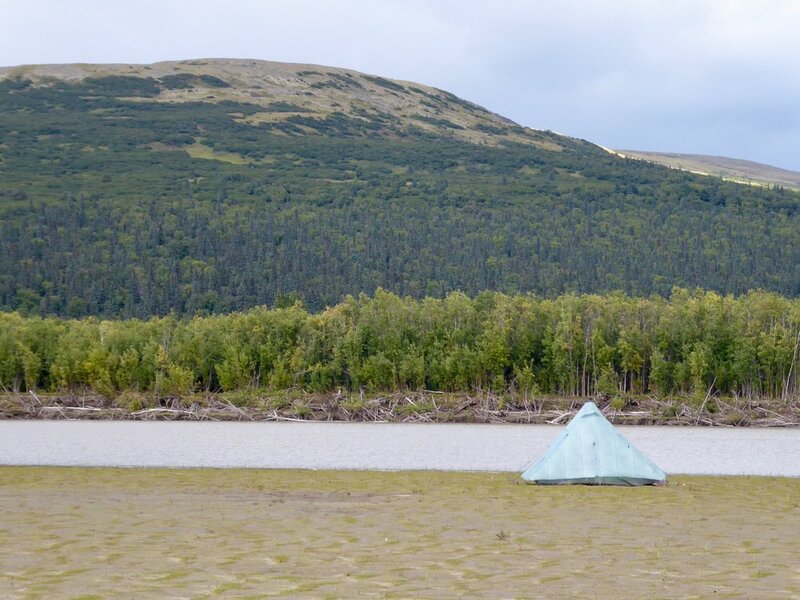 We pitched our new tent and slept soundly by the Tok River. Our home for the next 2 months! The next morning found us driving steadily to Whitehorse. We were fortunate to see a Grizzly Bear enjoying the grass along the highway. One could say that our expedition begins today. Today July 2, we head to Skagway, Alaska to pick up our permits to hike the Chilkoot trail. Up early to take a shower, because it is hard to know when we will get that luxury. We are grateful that two intown staff from the Yukon branch have offered to take us to the trailhead in Dyea. As we ascend to a pass the weather turns cold and rainy, snow is on both sides of the road. In the distance we can see part of Tagish Lake called Windy Arm. It is living up to its name as white caps can be seen. In a week we will be in our canoe and paddling this lake. Now though our thoughts are geared to hiking. We make it to Skagway by noon and are able to get our permits and train ticket. 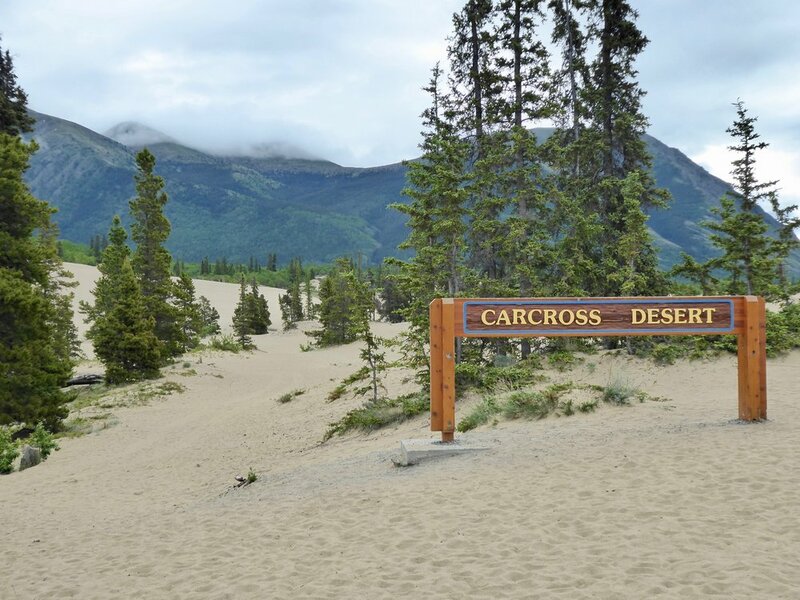 We are taking a 26 mile train ride from the end of the trail to Carcross where our canoe is located. Skagway is a destination port for cruise ships. Today there is only one ship docked. There can be as many as 5 swelling the towns population over 15,000. Last year when we ended our kayaking trip we were overwhelmed by the large number of people walking the streets. Today in comparison the town seems almost deserted. At the Chilkoot visitor center where we get our permit, we are required to watch a video on bears. it does make one more bear aware which is always a good thing. After lunch we drive the 9 miles to the Dyea campground. At one time it was the largest town in Alaska having a transient population of 5,000 to 8,000. Just about every service was available for the gold rushers of 1898 including, hotels, breweries, an ice house and post office. Today, however, little remains of the bustling town. We pay our senior citizen fee for the campground, say good by to our drivers and set up camp. Shane and Gabby transport us to the Start of the Chilkoot trail. Setting up our new tent and making dinner. 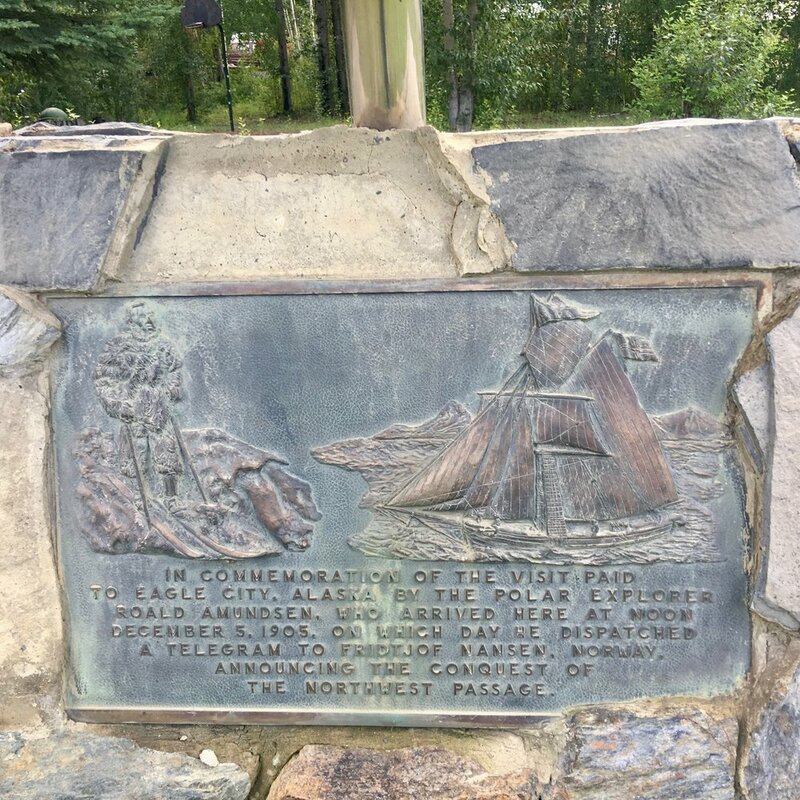 After dinner we take a short walk to the trail head and read the historical information and try to visualize what it would be like with thousands of gold rushers getting ready to head up to the pass and on to the Yukon River. July 3- We are off and hiking before anyone else. It is our usual mode of getting on the trail early. The trail begins with some rocky and steep sections, but soon a relative flat path occurs. We follow the river until we come to an area known as the Beaver ponds. We appreciate all the work that the National Park has done putting in board walks. Otherwise we would be wading in water up to our waists. Glad to have the board walk! Hard to imagine the Gold Rushers passing thru here. This sign gives us pause, but it is our best option! We pass by Finnegans's point where at one time 75 tents were located as well as a blacksmith shop, saloon and restaurant. Now there is a warming shelter and several tent sites for hikers. We are planning to camp for the night at Canyon City which is about 3 more miles so we take a short break and continue on. Arriving at Canyon City, we pitch our tent and then take a short walk to the ruins of Canyon City. Before getting to the city ruins we once again appreciate the bridge that helps us cross the river. The ruins are mostly overgrown and again one has to imagine a town that was once here laid out in streets and blocks. There was a barber shop, taverns, hotels, restaurants, outfitting stores and a real estate office. We pass by an old stove. This stove probably cooked many good meals for the miners. One of the main reason that the town was placed here was that a tramway was built to help move the supplies that the miners were required to carry. The problem was that by the time the tramway was built the gold rush was mostly over. A large boiler is what remains of the tramway. Can only imagine getting this boiler to the town site. Beautiful ferns and reindeer moss cover the town site and nature covers up the one time active city. Ferns are a good plant for covering the ruins. We have most of the afternoon to relax and read older journals that have been left in the warming hut. One was written by a 19 year old who was caught up in the excitement of the gold rush. Hikers filter in to the camp thru out the rest of the day. Some seem quite prepared others not so much. One could draw similar parallels to the miners that hiked this same trail. We head to bed with the sound of the river putting us to sleep. During the night the rain starts falling. It is not unexpected as we are in a rain forest. One of the neat characteristics of this hike is the variety of ecosystems that one passes thru. July 4. Once again we are the first ones up and have had breakfast and broken camp while others are just waking up. To be fair we stayed on Yukon time which is a hour earlier than Alaska time. Today we head up to Sheep Camp. It is only about 6 miles away so no need to have a speedy pace. Sheep camp is where the miners stayed until they could make it up and over Chilkoot pass. 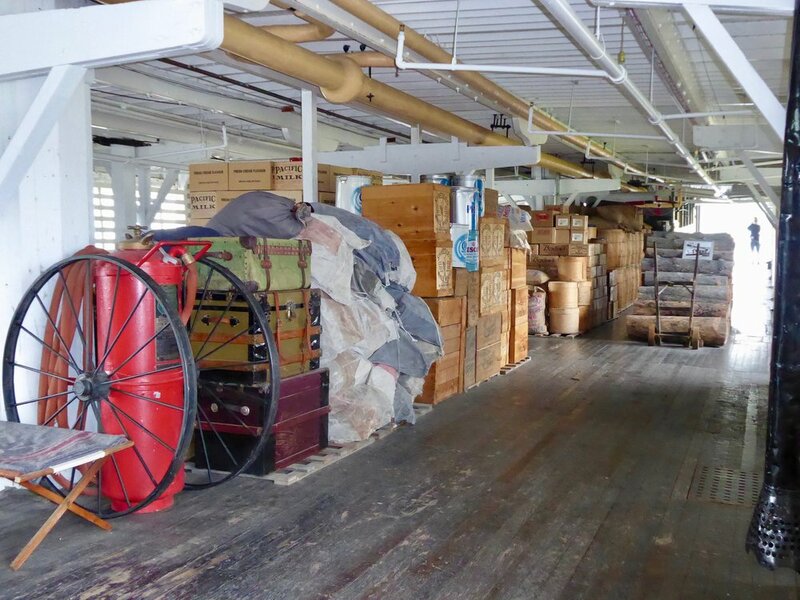 There were 16 hotels, 14 restaurants, 13 supply houses, 5 doctors,3 saloons, 2 hospitals, bath house, lumber yard and post office. At times there were between six to eight thousand people passing thru. Today there will be around 50 as that is the number that can go over the pass at one time. We are the first to arrive at sheep camp and find a tent platform to pitch our tent. A large open shelter has been built, along with 4 warming huts. The warming huts were put to good use as hikers arrived wet and cold. An older log structure may have been what was left from earlier days. As we wait at this camp. once again we can imagine the excitement that was in the air over 100 years ago. The miners had to have a 1000 pounds of gear that they needed to pack over the pass. They either carried it themselves or hired packers. Native Americans who had used this trail for many years before the arrival of the miners were often paid to pack the gear over the pass. The standard load was 100 pounds and the record for one packer was 250 pounds. In April of 98 there was a potential for an avalanche. Many of the miners in their haste to get over the pass did not heed the warnings of the Native Americans and over 70 miners were killed when an avalanche did occur. Tonight we had an orientation of what one might expect for our hike over the pass. A ranger who had hiked up to the pass warns us of horizontal rain and no visibility. The temperatures will also drop and one needs to be prepared. This part of the trail is not to be taken lightly. It is recommended that we start the hike at first light. A man from Whitehorse recites a poem from Robert Service about not giving up. It seems quite appropriate for tomorrows hike. July 5-Up at first light, ate a hot breakfast, packed and on the trail by 5. We are the third group to depart sheep camp, which was apparently named because of it being a hunting camp for sheep. The rain fell steadily yesterday, but today it is barely misting. The mountains are covered in fog as we begin our ascent to the summit. Today we will be hiking the steepest part of the trail. The bushes are wet and we start out in full rain gear. a steady up but not steep yet. This trail was used by native Americans for many years pre gold rush as they traded items between the different tribes. We continue to walk up the trail, glad that the river is not flooding the trail, which it sometimes does. We catch up to a father and son team from Germany. The father has hiked the trail two times before and has brought his son along this time. We are all hoping the fog will lift. At least the rain has stopped. They pose for a photo op. Still smiling knowing that the Golden Stairs are soon to be part of the hike. The trail becomes more rocky and at times we are walking on snow. Glad that we are hiking it now and not a month earlier. For summer hiking it is cold! The miners liked hiking it with snow on the ground as it was easier to hike than hiking on rocky terrain. Next stop will be the scales. By the time the miners got to the Scales many had turned back and lots of pack animals had been killed not being able to traverse the terrain. There are various pieces of artifacts scattering the trail. One quite obvious is the telegraph line used for communication to Dyea. The rocks are getting quite slippery now and the snow icy. Later though as the snow becomes soft it will be harder to walk as one will sink in. Glad to have our trekking poles! The next sign we come to tells us about the Golden Stairs. This was the steepest part of the trail. The snow has melted off of the boulders. This is the crux part of the hike. It is a scramble but not long so sometimes using all four appendages we make our way to the summit. A famous photo is often shown of the miners trudging their way to the top. One could not step out of line to take a break or one might wait several hours to get back into the line. The black line in the center is made of people on their way to the summit. We were glad that the Park Service has marked the trail with orange markers, otherwise in certain conditions it would be easy to get lost. Still hoping for the sun to lift. And as Don makes his way to the summit, the clouds are beginning to break up. We are now back to Canada and begin our descent down the other side. We can't keep from smiling as the blue skies appear! Just over the pass is the Canadian warden's post. A small hut lets one get out of the weather. It is not heated and soon as our bodies chill we need to continue on down the mountain. Later we learn that the hikers of yesterday who summited in no visibility and rain had about 20 people in the hut. The hut was warmed by body heat. 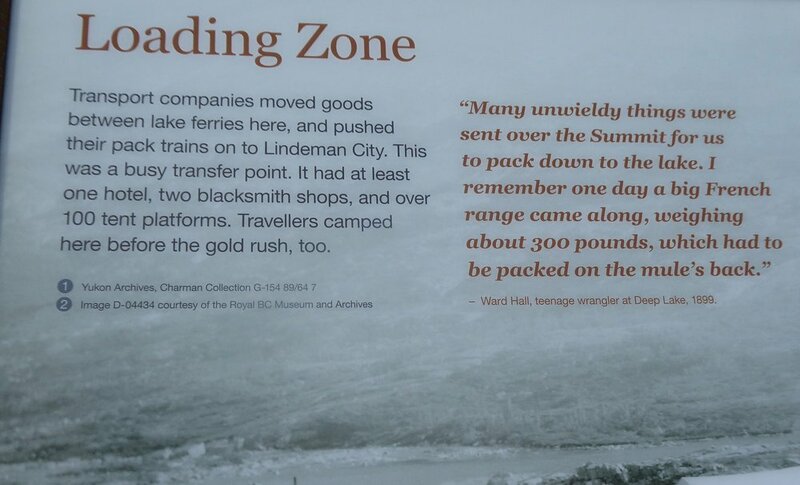 During the gold rush the Canadian Royal Mounties were stationed here and checked that the gold seekers had the required 1000 pounds of gear and food. As we continue down the mountain the skies become clear and we often stop to take in the scenery. We are grateful for the weather window of the afternoon. As the snow melts along the trail various artifacts begin to appear. we are amazed at the size of this saw blade. Pity the person that carried this on their back. We work our way down thru boulders, snowfields and streams. Starting to feel that summer might come after all! When we are warned by two birds that are most likely protecting their nesting areas, we feel that this is a good sign of summer approaching. We make it to Happy Camp, the first place one can camp after the pass. 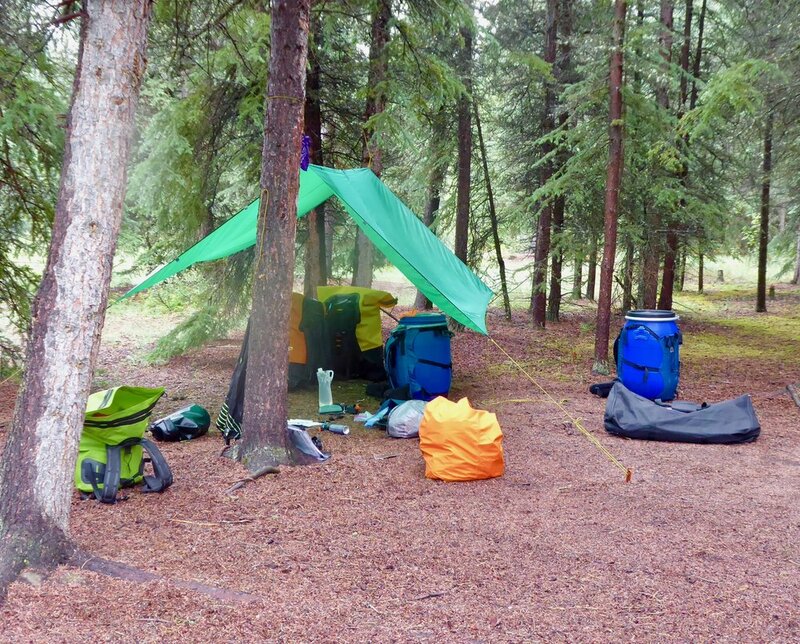 It has numerous tent platforms as most hikers will stay here. We have lunch and hear stories from the hikers who went over the pass in wind and rain yesterday. I must say that our hike was a bit more scenic than theirs. We are continuing on to Deep Lake. There is no shelter here, but the weather seems like we may not need one. As we drop in elevation, there are more lakes to pass. The miners took advantage of these to move their gear. No boats are in service today so guess will be carrying our packs tomorrow! Several old artifacts are scattered around our campsite. Hope they had an extra. The flowers are in full bloom around the campsite as well. As dinner approaches we are joined by two other groups, a couple and a party of three. It is a nice change from the large number of people at Sheep Camp the night before. We sit around the one picnic table and have some good conversations. July 6-It is a leisurely morning for Don and I as we still have one more night on the trail before reaching the end of the trail. The friends that we had dinner with last night are hiking all the way out today. Rob, Keith and Rob's son Adam. Keith lives in Whitehorse and an older relative was a captain on one of the steamships on the Yukon. Keith in true Canadian style uses a hockey stick for his trekking pole. Meeting and talking to people is always so much of our travels. Love that everyone has a unique story. As we headed down the trail we were once again reminded of the historical aspects of the trail. Next to the trail was the remains of an old rusty boat. The trail started out going down a gentle wooded path surrounded by wild flowers. During the gold rush this section of trail actually had a road that in the summer time was filled with horses and wagons carrying the gear to Lindeman. Each flower brightens the path! Before one could reach Lindeman, though, one had to go thru a gorge that connected Deep Lake to Lindeman lake. This again was the site of many miners demise. There were stories of the miners sledding down this gorge in the winter time and in the summer time trying to run the rapids with moderate success rates. Soon we saw Lindeman Lake in the distance. Again we had to picture the scene of 1898. This was a transient camp so not many amenities were offered here. At one time there were over 4000 tents here waiting for the lakes to melt. Every tree within hauling distance was used for boats, shelter or firewood. At the Lindeman lake campsite a wall tent was set up with books and photos about the gold rush. We stayed for quite a while reading and looking at the photos. The trail winded up small hills and around rocky points. 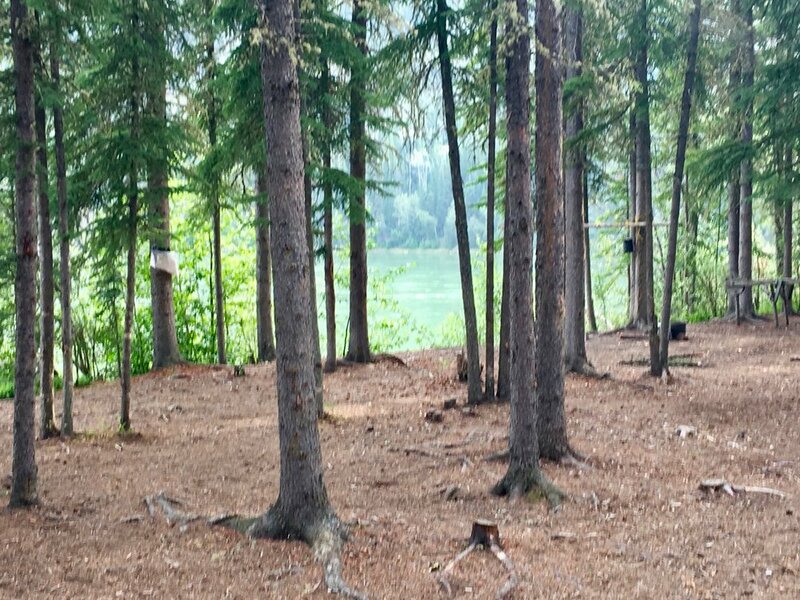 But finally we ended up at Bare Loon Lake and set up camp for the night under sunny skies. Tomorrow is our last day on the trail. July 7 We were eating breakfast by 5 and starting hiking by 6. It was a beautiful morning as we hiked toward Bennet. Along the way there were numerous signs telling us of the travels of the miners. 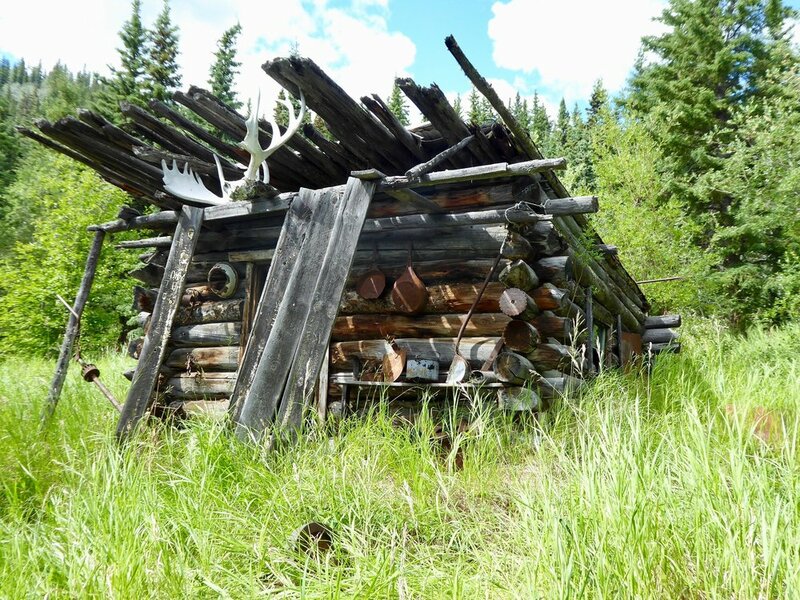 An old trappers cabin was built along the trail. A sign on the door welcomed its usage as long as it was left in the same manner as found. As we continued hiking the trail became one with a sandy surface. I don't imagine that the miners enjoyed carrying their heavy loads thru this. A side trail took us up to a cemetery. Several of the men had died putting in the White Pass railroad. Others had died while trying to transport their goods on the river connecting the lakes. Graves were marked with the logs. Soon Bennet Lake came into view. We are sure that the miners appreciated the view as much as we did. As we were sitting enjoying the view, the bugs decided to join us. We were glad that they were not able of find any skin to attack! The view was worth the tolerating of the bugs. The sign described what we would have seen if we arrived with the miners. We came upon the sign and so ended our hike of the Chilkoot trail. We didn't agree with the last sentence as we would surely hike this trail again! We had several hours to explore the town site before the arrival of our train to Bennet. 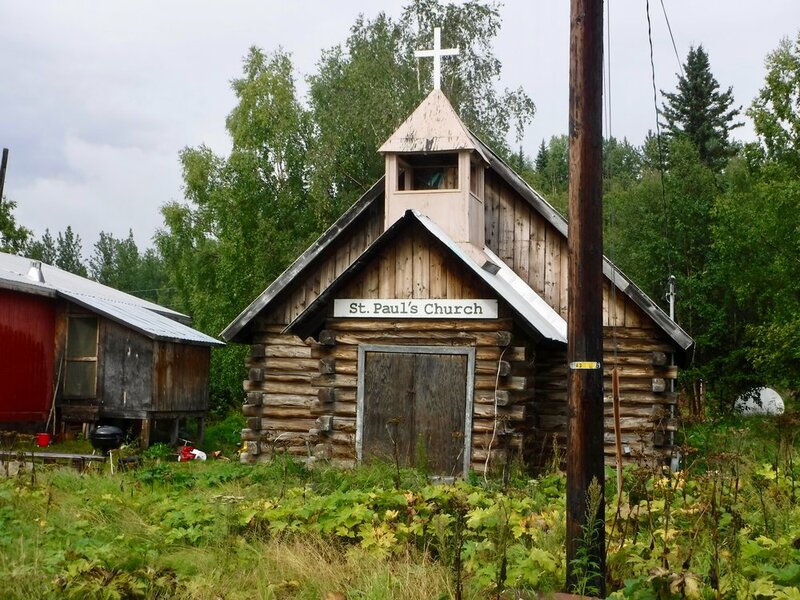 The only building that is left from the gold rush era is the St. Andrews Presbyterian Church. It is being restored and hopefully will be protected. A wild rose shares its beauty. The White Pass Railroad station is located here and we will be boarding the train at 11. First though we look at an old boat that was built in 1897 on the lake shore. Over 7000 boats left this shore when the ice went out. A lot of trees were cut down to make this happen. An intersting sign inside the station listed what a miner had to bring with them when they crossed the border. Next to it was this note. The train arrived as scheduled, the hikers were shown their cars. Smelly hikers are separated from the other passengers. Soon we are on our way to Carcross and as we pull out of Bennet the rain begins to fall. Todays hike was perfect timing for good weather. Glad to be on the inside looking out. The Chilkoot trail is an outstanding hike filled with beauty and history. 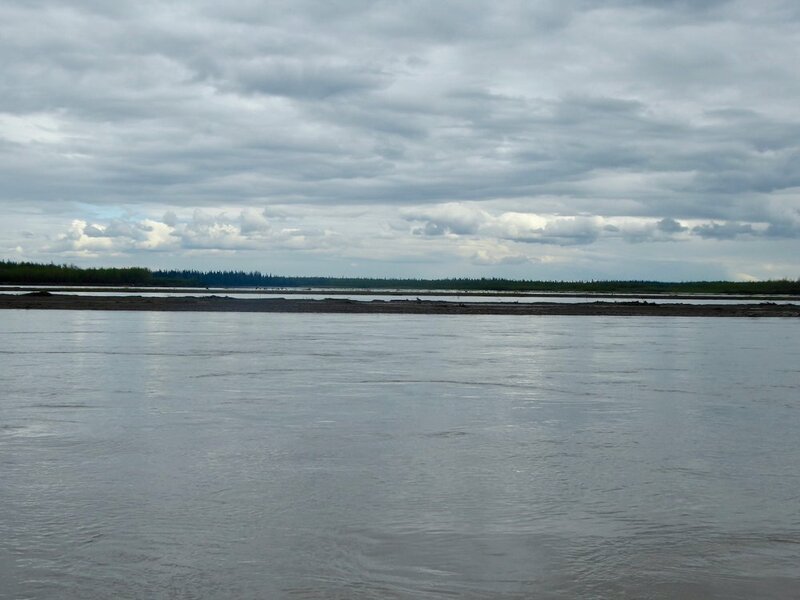 Now we are headed for the Yukon River to continue our trip to the Bering Sea. As the train pulled into Carcross, the clouds opened up some and the downpour turned to intermittent rain. We gave Dustin a call and we were in luck. He was at his house and said that he would bring our canoe and gear right over. 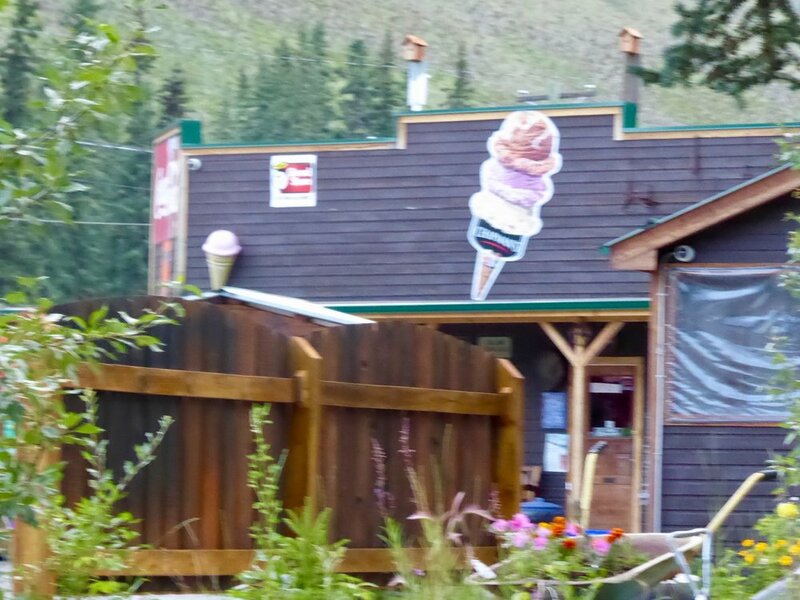 In the meantime we thought it more than appropriate to have a sandwich at the restaurant Dustin owns in Carcross. There was good food to be eaten at the Bistro! By the time we had finished eating our gear was outside and we were ready to unpack our backpacking gear and get into canoe mode. Can't wait to see if it all fits. It was a bit of a pull,however to get a very heavy boat off the shore and into deeper waters. By 5 o'clock we were into Nares Lake and heading to Windy Arm. We had seen Windy Arm on our way to hike the Chilkoot and had quickly realized how it had gotten its name. In fact one of our guide books had stated that this was one of the more dangerous parts of the trip. There is a long fetch and any wind can build waves quickly. Stories of boats getting wind bound for days made us approach this section with caution. It was soon quite obvious that we had a great weather window. The lake was quite calm and with long days we decided to keep paddling. The lake stayed like this until we found a camp for the night. It was somewhat challenging to find a campsite. 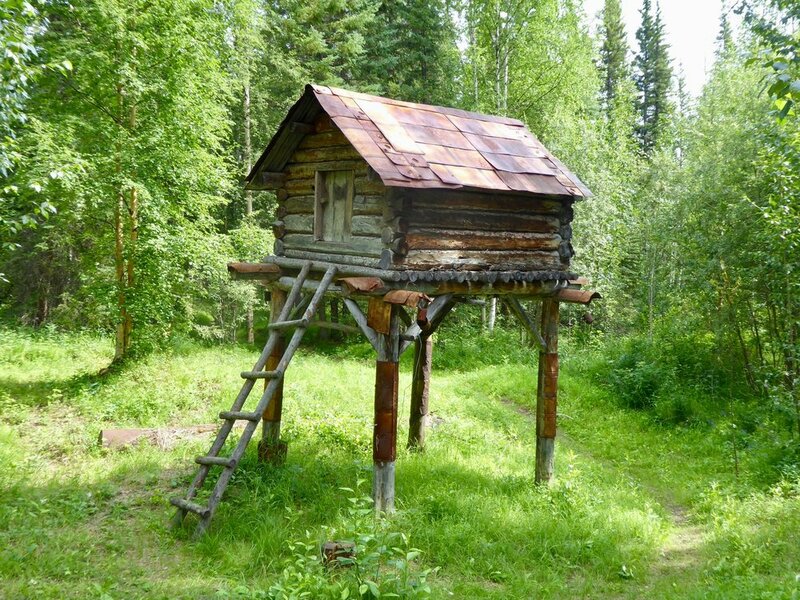 The first couple that we had checked out were occupied by cabins. Finally though just as the rain began to fall, the perfect site appeared. We barely had time to put up our tarp and tent before the downpour began. This is going to be the first big test of our tent and we sure hope that it lives up to its reputation. 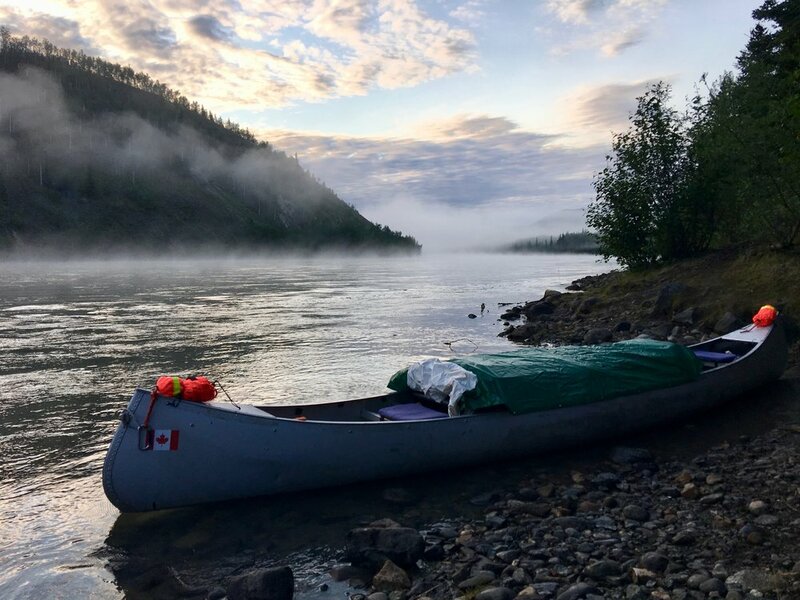 We go to sleep somewhat in disbelief that we are now canoeing on our way to the Yukon River. The transition from hiking to canoeing couldn't have gone smoother. Don's favorite sentence is that the Yukon has the distinction of beginning 17 miles from the Pacific Ocean but it runs close to 2000 miles before it finally hits the ocean. We have a lot of paddling to do in the coming months, We go to sleep tired but ready for this part of our journey to begin! The rain continued to pour all night and was still coming down in the morning. We were pleased that we had stayed quite dry inside the tent. Finally around 5 the rain let up a bit and we quickly packed up and ate breakfast under the tarp. It appears that this is going to be a rainy day. We pulled out the spray deck and with all the extra gear that we were carrying it still fit. The deck is going to keep us quite dry today. We had made it past Windy Arm last night and the conditions were still good for us to continue down Tagish Lake and past Taku arm. Even though no wind was blowing we were still getting small swells on the lake which was making steering the boat somewhat difficult. 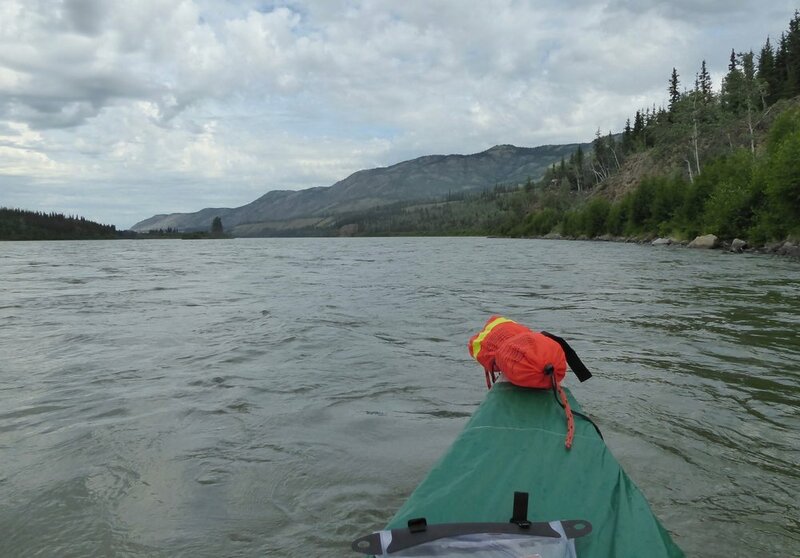 We kept up a steady paddle and soon were at the connecting body of water between Tagish Lake and Marsh lake. A light current was pushing us towards Marsh lake. When we entered Marsh lake the sun came out and we decided to take this opportunity to take a break and pull out our very wet tent and tarp to see if we could dry it some. A very large porcupine greeted us before showing us his quills and sauntering off into the woods. Marsh lake is quite shallow and can make large waves under the right conditions. There did not seem to be a lot of camping so in the late afternoon when a site that we had read about looked like a winner, we pulled off and set up camp. We are pretty sure that we are at a location called Sand point by one of the guide books. Easy to see how it got its name. Soon we were unpacked and set up camp. We tried to get more organized, but we may have to wait until we get rid of some gear. Just glad that it fits into the boat and we can get our spray deck over it. Quite the change from the rain from yesterday. We feel quite prepared for whatever conditions that we encounter! Not a bad view from the tent site. It was a colorful sunset last night and the morning greeted us with calm water. 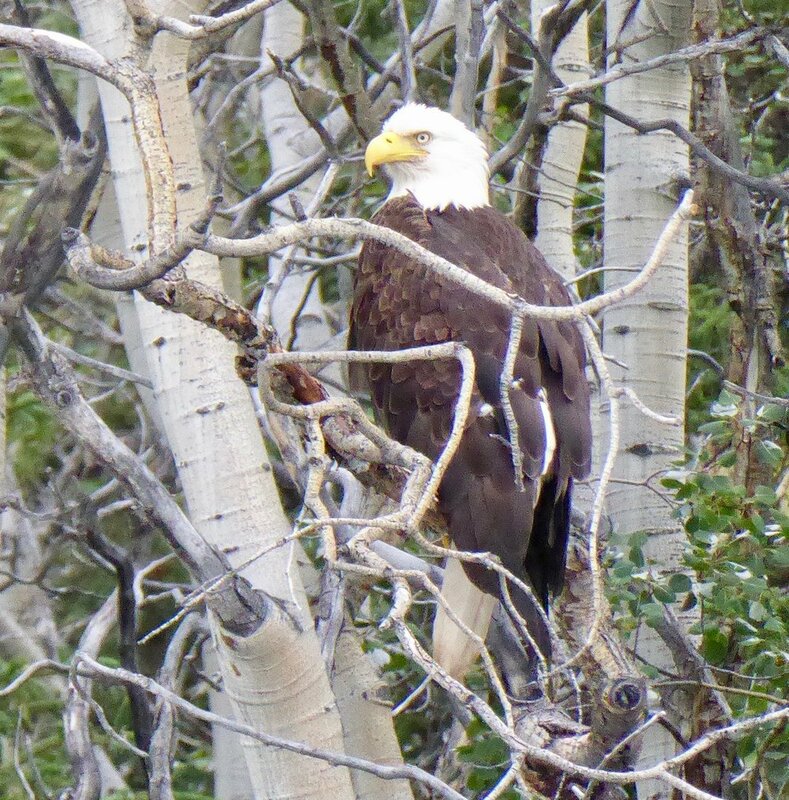 As we were paddling away from our camp, an eagle swooped down caught a fish and then swam it to shore. Always fun to see eagles use their wings to swim. As the morning progressed, the wind came up and we thought that perhaps we should have paddled more last night when the conditions were better. The wind and waves were coming directly at us and our forward progress slowed considerably. For awhile it almost seemed that we were going to have to land and wait the wind out. The spray deck kept the waves from splashing into our boat and we slowly made it towards the start of the Yukon River. We saw a bridge in the distance which is where the Alaska Highway built in 1942 crosses the Yukon River. This is where canoers often put in to avoid the large lakes. 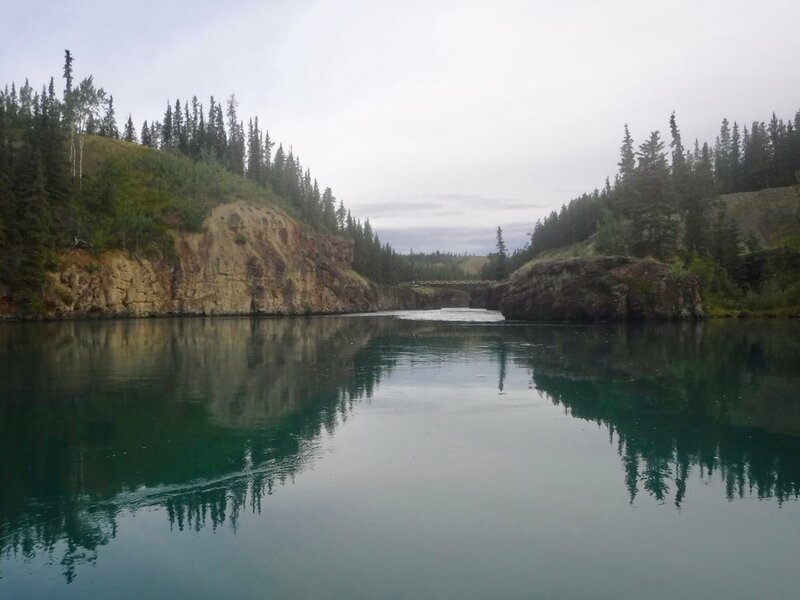 Just below the bridge we encounter the first of the two dams that are on the Yukon river. This dam was built in 1923 to flush spring ice from the upper river and Lake Laberge. 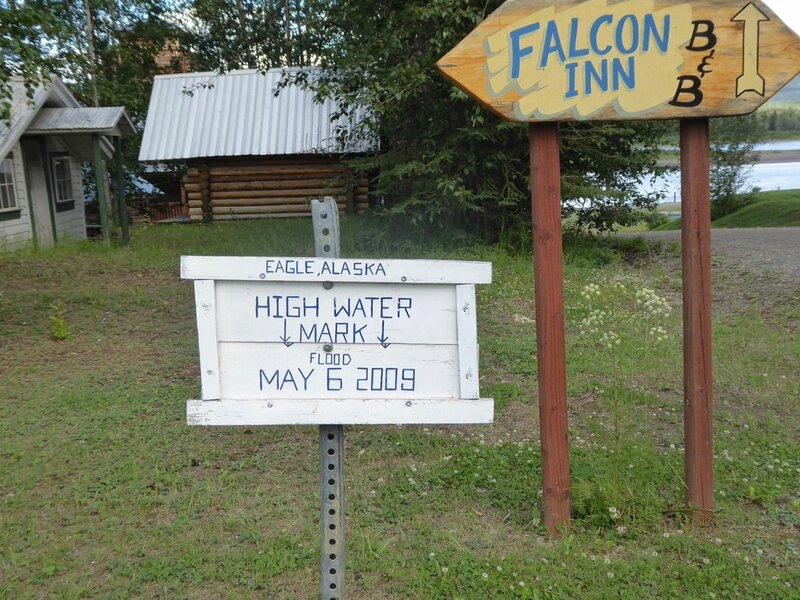 This was accomplished by releasing stored water early in the navigation season. By doing this steamers could leave Whitehorse two to three weeks earlier. No more steamers are on the river but it is still used for water control One must go thru a manually operated lock system that comes with step by step instruction. When we approached the locks the gate to pass thru was closed which normally would mean that we would have to get out of our boat, turn a wheel that would open the gate, paddle thru then get out of our boat to close the gate, wait till the water leveled then open the gate to let us paddle out. Just as we had approached the locks and had gotten out to read the instructions, a motor boat had approached from the other side and the passengers had also gotten out. They were not going thru, but were keen on seeing how the locks operated. There was a bit of disagreement of how it worked, but finally the system was figured out and we were able to enter the lock. Waiting for the water level to lower. Moving out and feeling that we are officially on the Yukon River. The river is a beautiful blue color and the current has begun. We are now on our way and heading toward White horse. 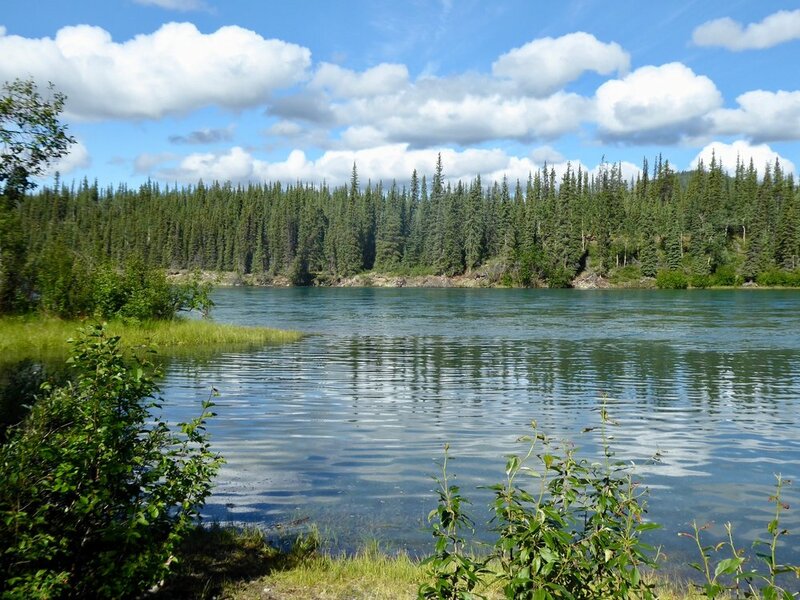 This is a popular stretch of the Yukon with easy access and several of the marked campsites are full. 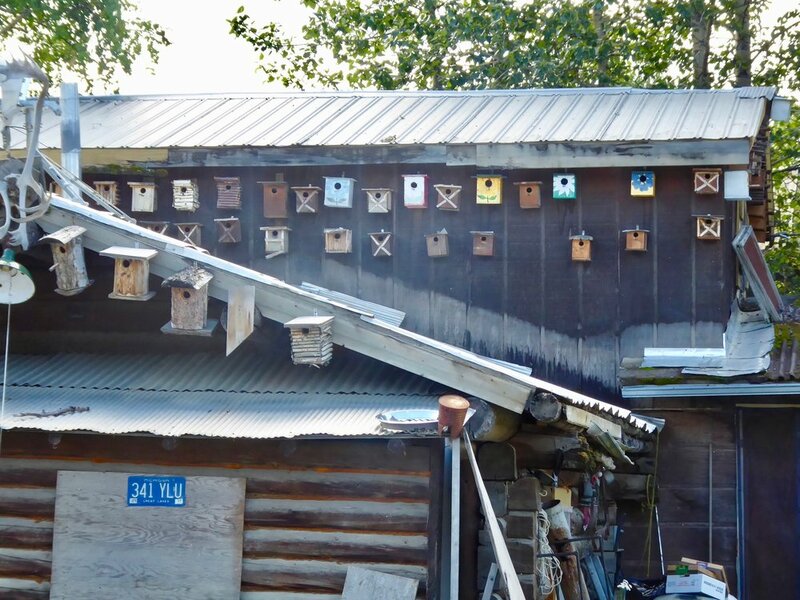 Also since it is close to Whitehorse there are quite a few cabins. The rain has returned and we start looking for a potential site. We find one that is acceptable and will protect us some from the rain. It has been a long day so a quick supper and we are off to bed. 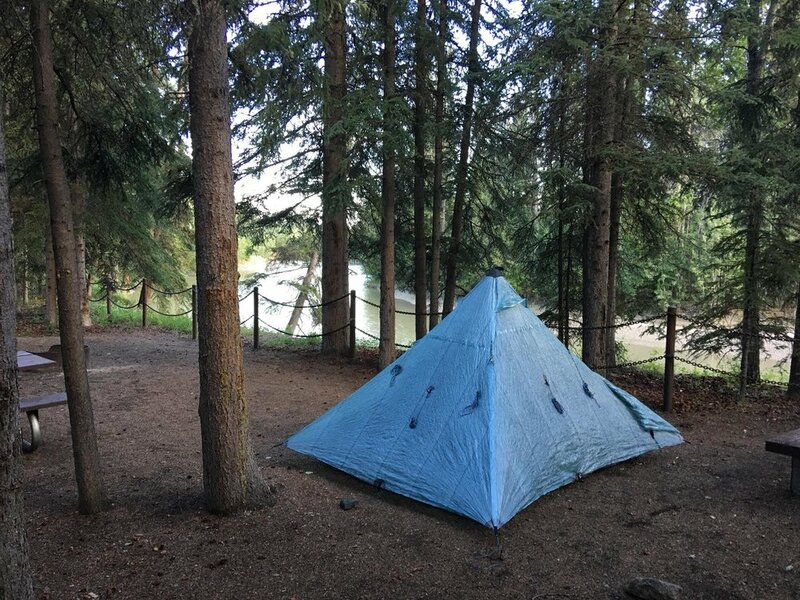 The campsite last night was a 10 for getting out of the conditions, but a 5 for vistas, but nevertheless we slept well and were on the river by 6. Shortly after starting to paddle we arrived at Cannon City. Had we been a miner in 1898, we would have been warned by numerous red flags telling us of the dangerous waters ahead. During the spring and summer of 1898 over 7000 boats were going down the river. This stretch caused many boats to be destroyed and lives lost. Finally a man had an idea of building a 5 mile tramway around the rapids. 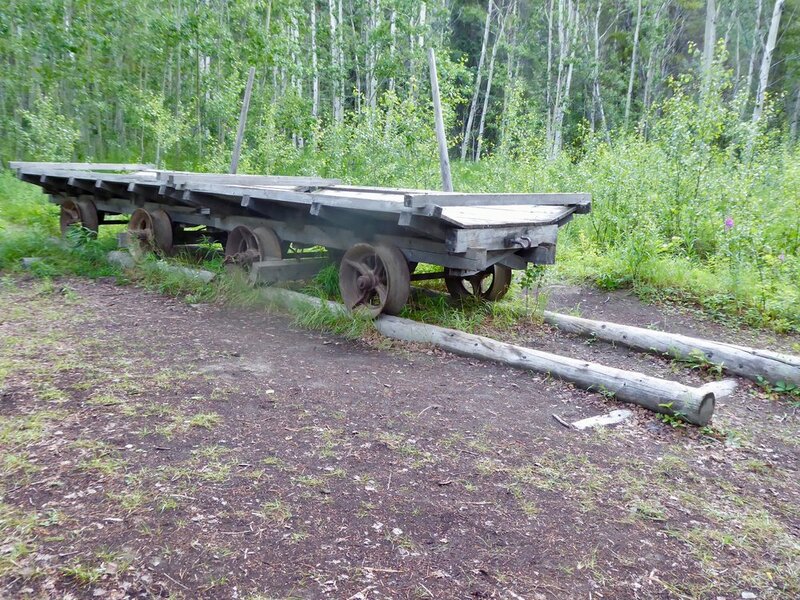 this tramway not only helped the miners to get around the rapids, but also allowed steamboats to unload their goods below the river and then transported around to a waiting boat above the rapids. We were able to land here and take a walk thru the old Canyon City site. There was a replica of the cart that hauled the goods and signs telling of the tramway. Horses were used to pull the wagon. Canada has lots of signage. With no fear of rapids, we load our boats and paddle/float thru the senic Miles Canyon. A little over a week ago we had looked at this section of river from an overlook. In 1958 the Whitehorse Hydroelectric Development dam was built causing the water to back up ,cover the rapids and form Lake Schwatka. Not quite a thrill seeking section, but a beautiful one! Soon the large dam come into view and we look for the public landing to take out the canoe. 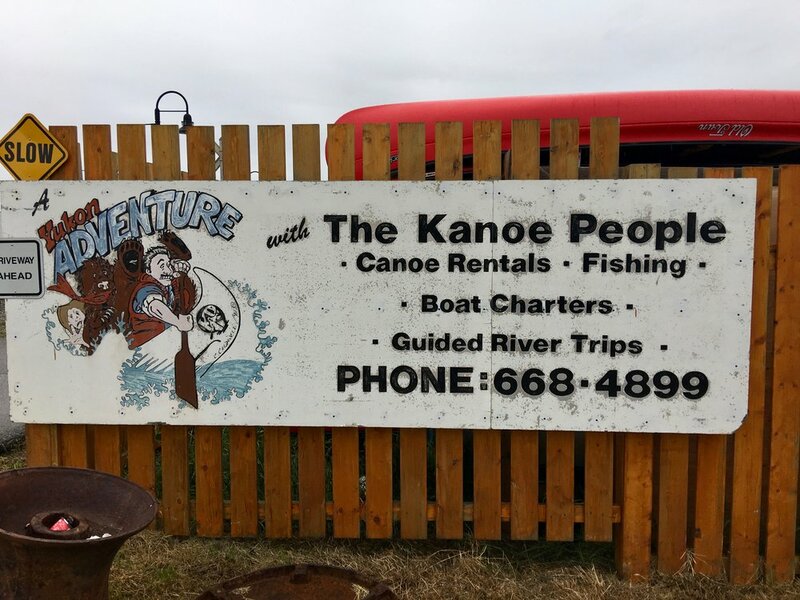 If all goes as planned we will call Kanoe People and they will send a shuttle driver to pick us up. We have arrived to the landing by 8 and alas no one answers the phone till 9. Shane is the only one working this morning and is not sure when he can find someone to pick us up. He says that he will call us when he has more information. It will happen but it may not be timely. A mother duck and her 10 ducklings entertain us. Almost immediately after hanging the phone up it rings and Shane is glad to inform us that a driver is on his way. Wayne, an older gentleman who helps out as needed at the store, had just walked into the store to see how he could be of assistance. Shane told him about us and Wayne was on his way. The loading and getting around the dam could not have been more efficient. A half day portage with lots of effort had become a 10 minute drive. It was also quite interesting talking to Wayne who had many stories to tell. Whitehorse is a town of about 30,000 and the capital of the Yukon territory. it will be the largest city by far that we will have contact with until we fly back to Anchorage. 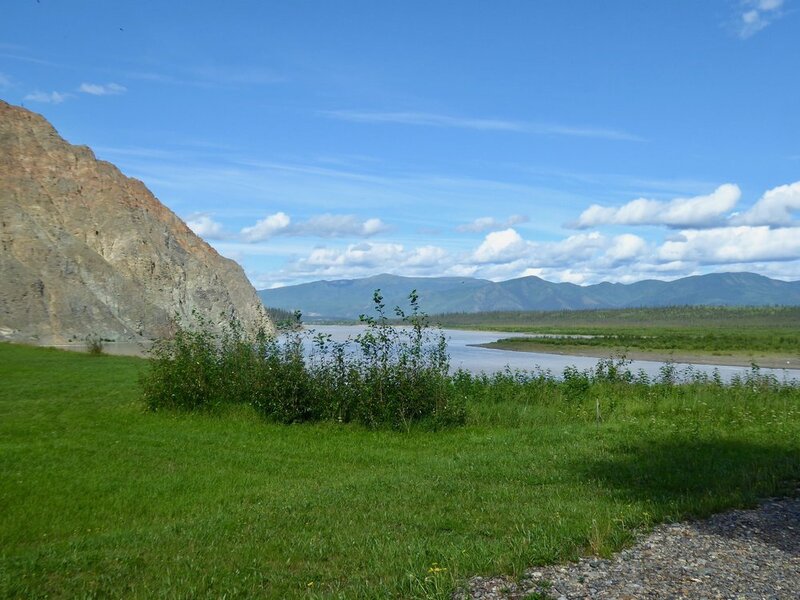 Our next logistics will occur about 12 miles from here at the Takhini river. 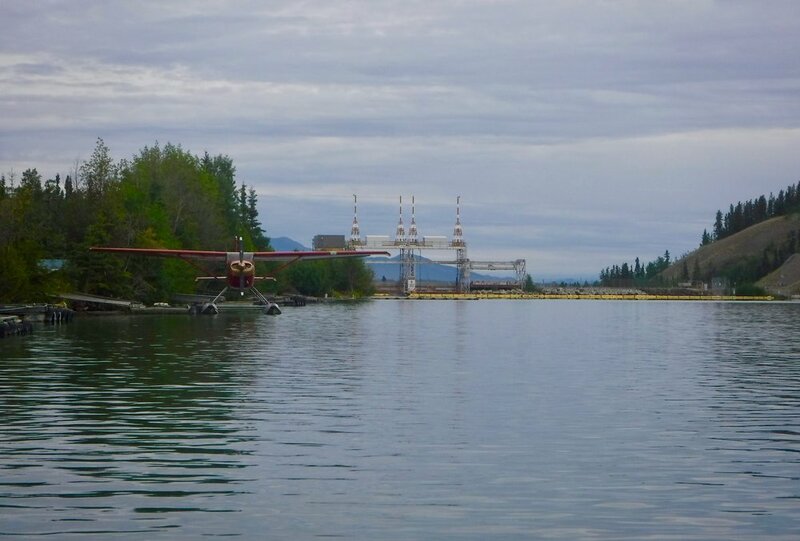 Shane who drove us to Skagway is planning on meeting up with some food and gas resupplies.When we land at the bridge, we give Shane a call and he says that he will be there soon. We have time to check out a potential campsite. Nothing looks great, but we can make something work. Shane arrived so promptly that we decided just to load the extra items as best we could, put the spray deck over it and try to make it to Egg Island. The rain was threatening , but we were able to make it to the campsite and get set up before the rain deluge came. We are impressed with the Canadian campsites. This one has a covered picnic table and an outhouse. Packing the boat tomorrow will be interesting. The rain came down in buckets last night. We were able to fill most of our droms for drinking water from rain water pouring off of the tarp. We decided to wait for a little while this morning to see if we could get a break in the rain. By 9 it has cleared some and we were able to load our boat keeping our gear dry. We sure are appreciating our spray cover. 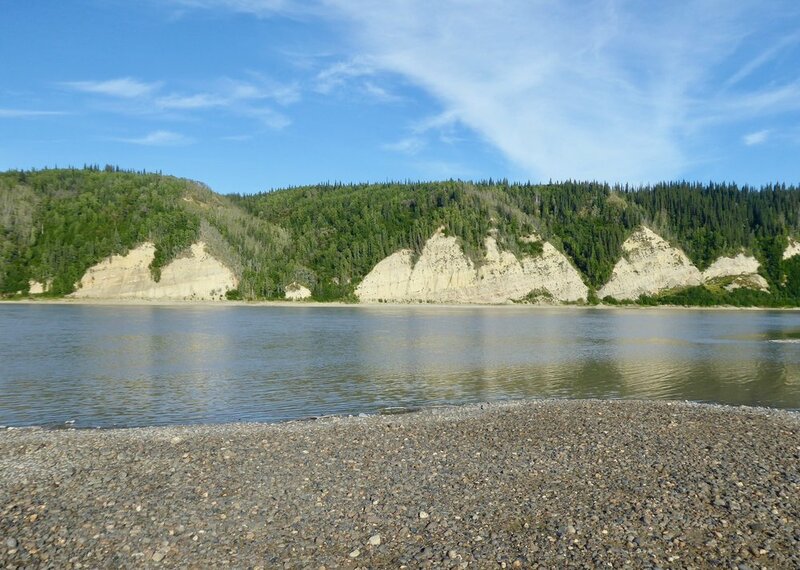 Today we hope to be paddling the shores of Lake Laberge. Lake Lebarge was named for a man who always wanted to see the lake but never had a chance before he died. It is also the location for the setting of the Cremation of Sam Magee by Robert Service. Before we get into the lake itself there are several large red arrows, most likely for larger boats. We took the most direct way. We weren't expecting this large arrow. 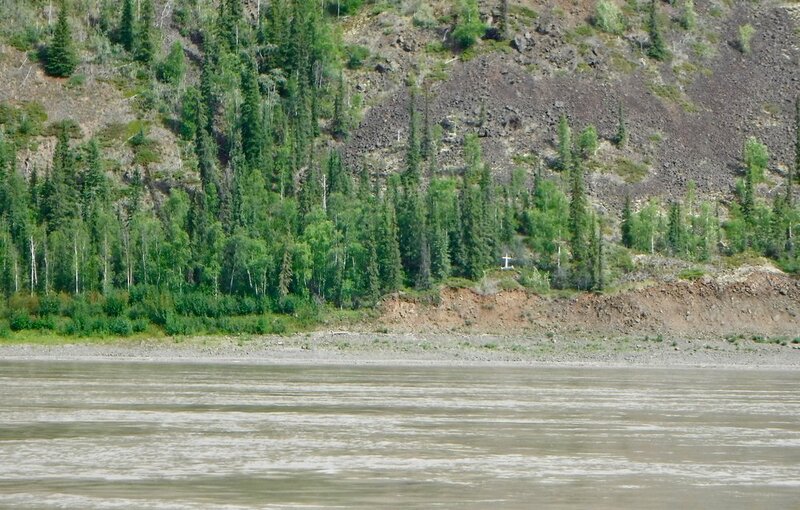 The Yukon can be quite challenging to find the right channel which was why there were so many steamboats destroyed when they hit a sandbar. This is not a concern of ours, but the potential for wind on Lake Lebarge has us heading to hug the shore. We have decided to head up the East side. There will be no current for today so we will be using our muscles to propel the boat forward. We are using the guide book by Mike Rourke to take us to Dawson. 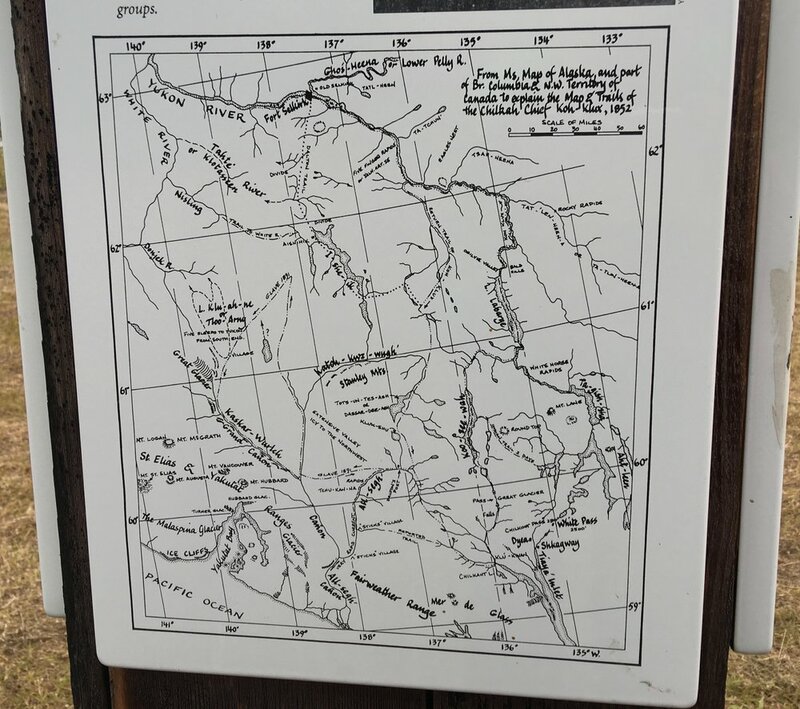 It is filled with historical information and maps that show potential campsites. Looks like we will have about a 30 mile stretch until we are back to the river again. This lake has a reputation for winds picking up quickly. We paddle steadily as the conditions are in our favor. Several folks have warned us the necessity of staying close to shore and we take their advice. We are impressed by the beauty of the lake and have gratitude for the ability to paddle today. We are appreciating the calm. On the east side their are numerous places to pull out, take breaks and camp. We paddle past several groups who are either paddling or camping. Going To Dawson from Whitehorse is a popular route. 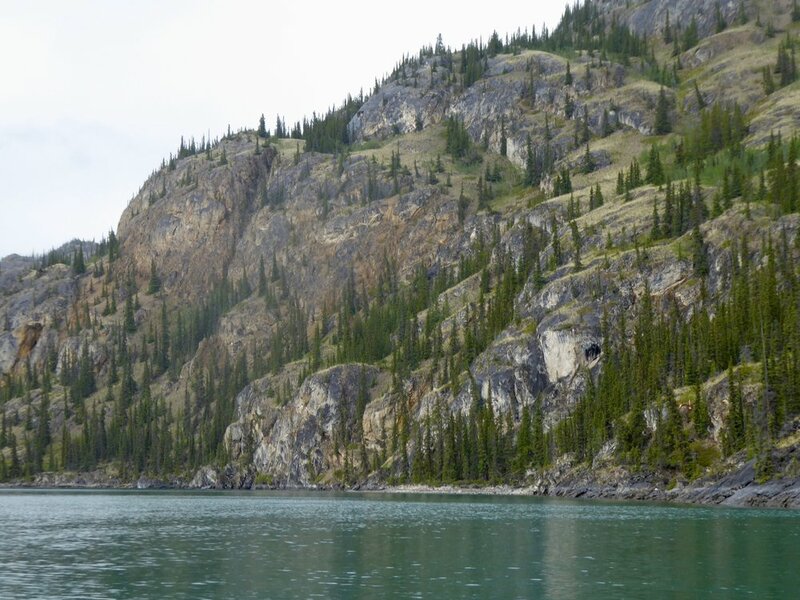 As we paddle along a cliff we hear the noises made by Peregrine chicks. As we scan the cliffs for the young, Don notices that we are fast approaching an adult perched on a rock by the shore. Had we not been looking up I doubt if we would have gotten so close to this bird. The falcon didn't seem to mind that we were approaching. Perhaps it was just taking a break from family duties. After seeing their talons, we have lots of respect for the powerful bird. This is the closest we have ever been to a peregrine falcon. We only have 6 miles to go before reaching the end of the lake, but as the wind started to pick up,and a campsite appeared, we decided to call it a day. it appears that this site had a cabin on it at one time. As we are making dinner, a large beaver approaches our camp. From a distance it almost looked like a bear cub. He checked us out and moved on. It has been a good day of paddling. Since at this time of year, there is a lot of daylight, getting up at 4 was easy.. It was a bit chilly with the temperature at 38. The lake was calm and the atmosphere was magical as the morning mist was rising from the warmer water. We were off by 5;30 and heading to the end of the lake where we will once again pick up the Yukon. It will be good to be off of Lake Lebarge and back on the river. As we enter the river there is a campsite with cabins and information about the area. One of the reasons that there were cabins here was that nearby there was a section of water that only froze when it got to be 50 below, and then only for several days. This was due to how the river flowed out of Lake Labarge. 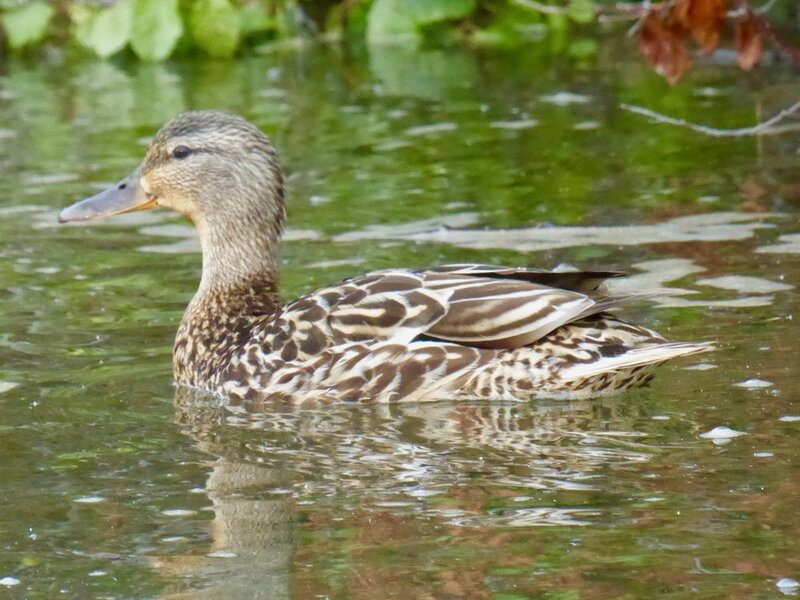 Today it is still a prime area for year round waterfowl. The telegraph office and roadhouse are still standing. A truck brought in over the ice in 1950 is also part of the scene. 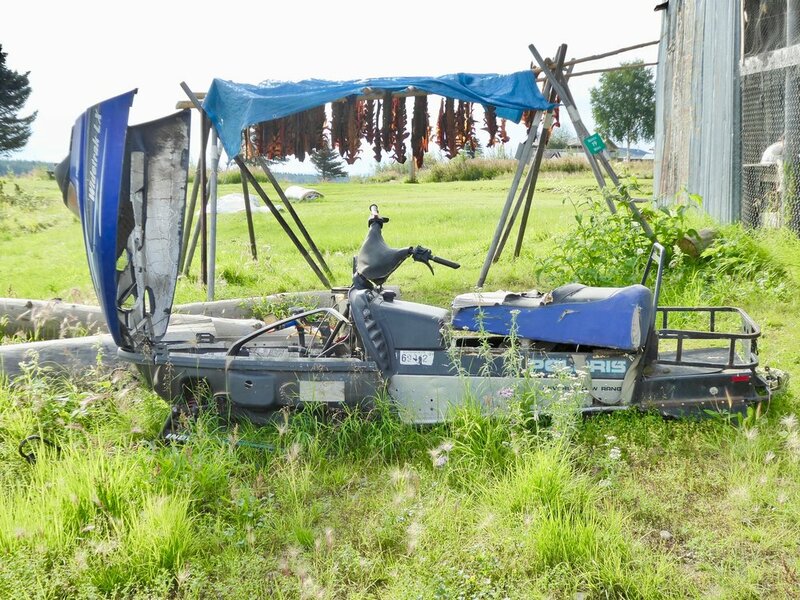 Next to it is a well worn wheelbarrow. 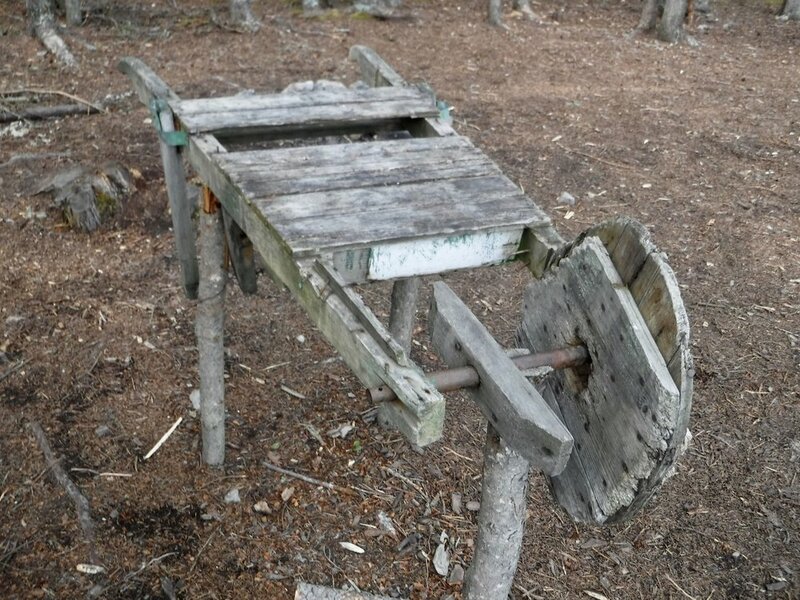 Never had to worry about the wheel going flat. It is easy to see why this section of river is so popular. Before the Canadian government blasted out some of the more dangerous rocks, this section was highly feared by the steamships. Our map indicates many sites of shipwrecks. Today though it is a fast flowing section with numerous places to pull over and check out old cabins. Getting ready to get on the river and the sun shines brightly! Along the way we pass numerous marked wood camps. The signage tells of their purpose. Lots of wood was cut down to fuel the steamships. 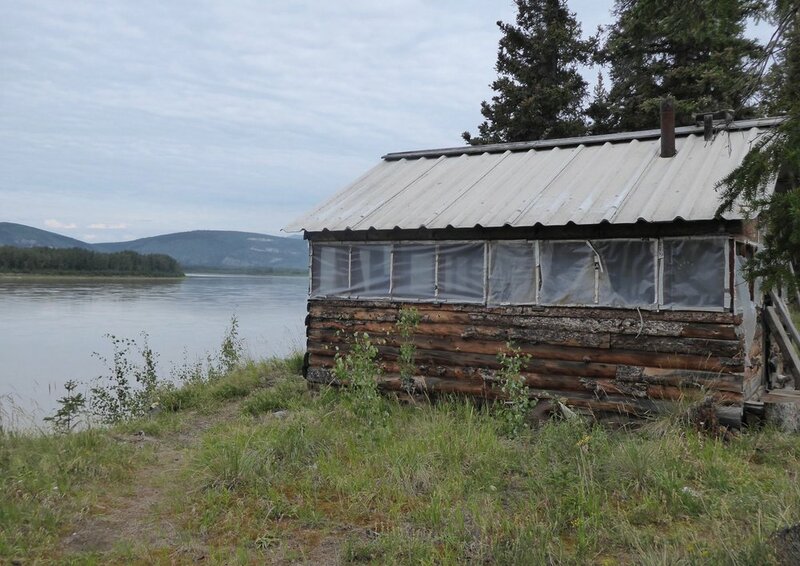 Cabins in many states of disrepair are seen on the riverbanks. Some we pull over to look others we just float by. We are enjoying the Canadian Parks campsites. They are well maintained with picnic tables and out houses. We stopped here to take a lunch break and Don a nap. We can see why this section of the river called 30 mile is a favorite of many paddlers. Every bend is a scenic view. We stop to check out a sport for the night and decided to move on, but first a butterfly makes an impressive landing on the shore. As we move down the river we are continually reminded of the importance of the steamships that plied these waters. For nearly 80 years steamboats were a lifeline for remote communities. During the summer months the steamboats were essential in the fur trade, mining and daily lives of the Yukon River residents. 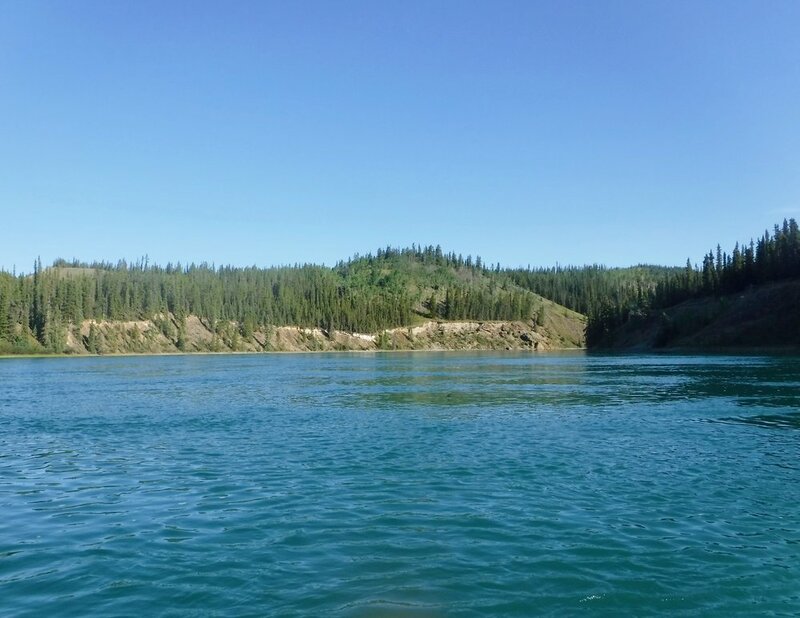 The Yukon River had the most steamships of any river. We made it to shipyard island where the remain of the Steamboat Evelyn lies. She had been pulled up for repair or storage, but was never returned to the river. She was built in 1908 wrecked in 1913 and had her haul replaced. It is not known how much usage she received after she had been repaired. Several other boaters arrive to share the campsite. This ship was 130 feet long and her gross weight was 352 tons. One can easily see why there are so many woodlots along the river. Another beautiful day of sun and blue river. Looks like the clear section of the river will be over tomorrow as the Teslin River joins in and adds silt to the Yukon. Our campsite is right below the steamship Evelyn. Knowing the history of the area and seeing this boat helps one to imagine what it was like over 100 years ago as this area was quite active. Enjoy reading the informative signs of this section. The birds wake us up early and by 6 we are paddling away from the shore. The other campers are still in their tents. We enjoy early mornings as we are more apt to see wildlife and have better weather conditions. The river flows swiftly thru this area and is also noticeable wider. Enjoying a hot cup of soup as we take a break to stretch our legs. The area that we are going by today has a lot of burned trees. We are grateful that the fires have not started near the Yukon this year, One result of the previous burns is the multitude of fireweed flowers in bloom. 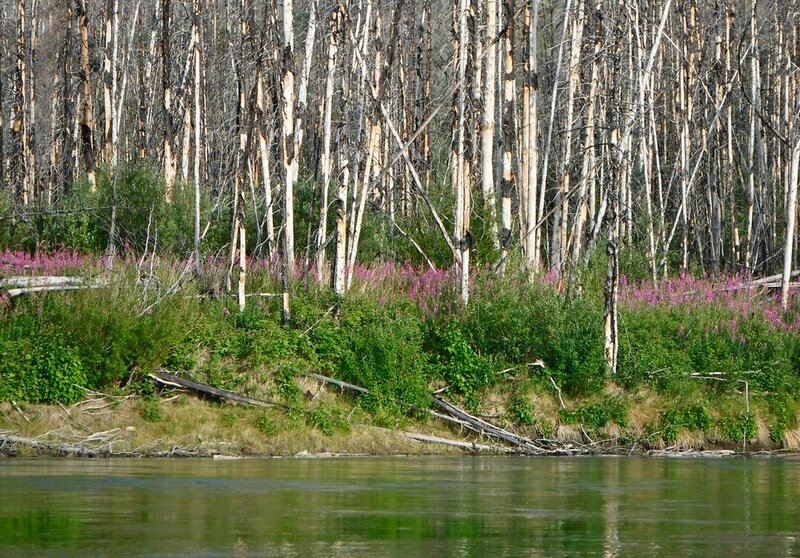 Both sides of the river are covered with fireweed. Which looks like this close up. Still plenty of blooms to open, by the end of the trip this plant will be gone to seed. They seem to be accustomed to being visited. No hand outs from us. Most of the cabins are in disrepair with roofs fallen in. We try to imagine what it would be like to live here during the winter when the temp would remain well below zero for weeks. One cabin, however seems to have a tradition as a book shelf is not loaded with books but a variety of bottles in all shapes and sizes. Looks like someone was having fun here. The guide book mentions that if one follow a trail for a short distance up the river one will find a cemetery. We pass by several more modern cabins that are used for gatherings of First Nations. Soon on a hill we see the grave sites. Some are marked by fences. Others are actual small structures called spirit houses. 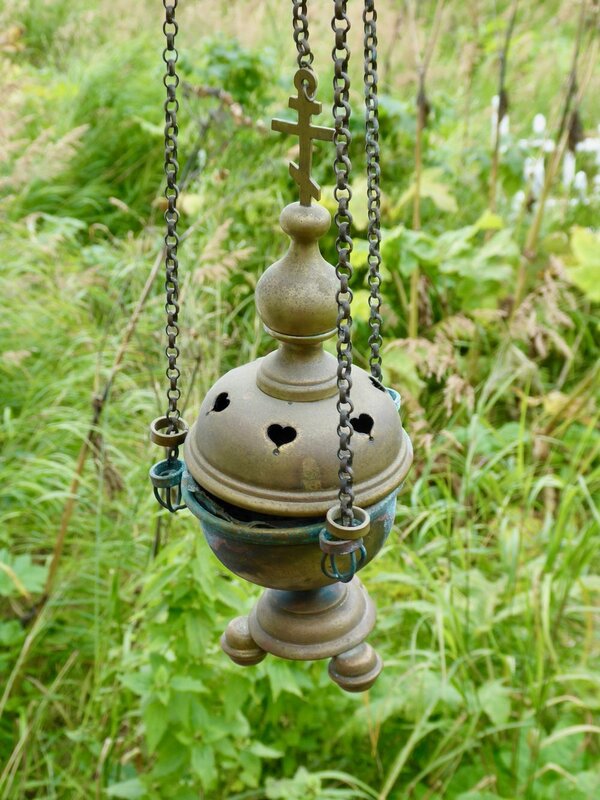 The deceased would often have some of their belongings placed in these small structures. Moving on, we check out an old gold dredge that is fast becoming eroded into the river. 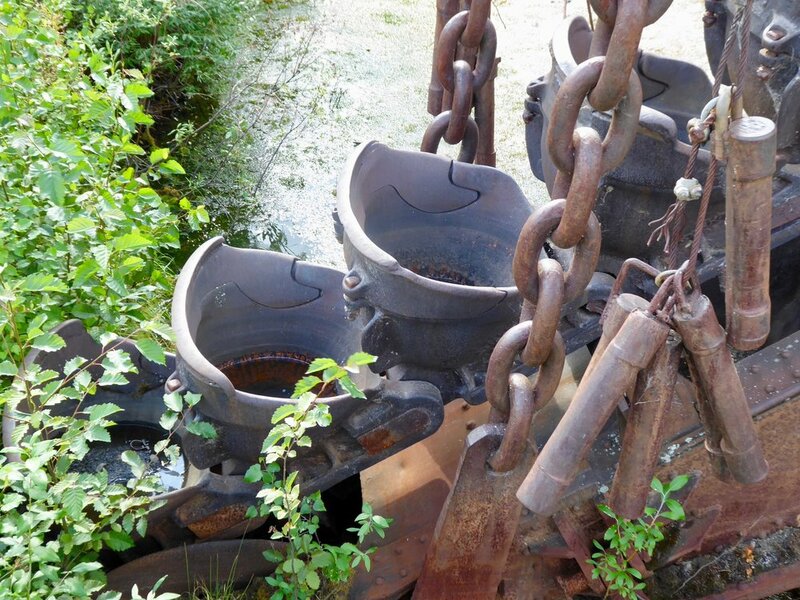 The buckets that were used for dredging are mostly what remains of the gold dredging operation. Building the dredge and getting it to this site cost more than what they made selling the gold they found. Frequently along the river are the woodlot sites that would supply the steamboats with lumber. 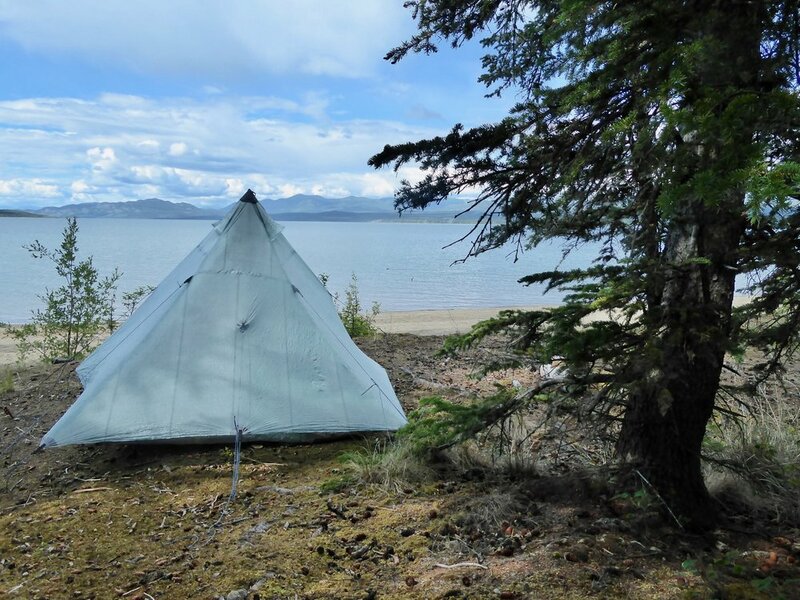 These sites make good campsites or rest breaks. They are often near eddies which make great pull out sites. If we had been here later we would have stopped, instead it is just a break from sitting. 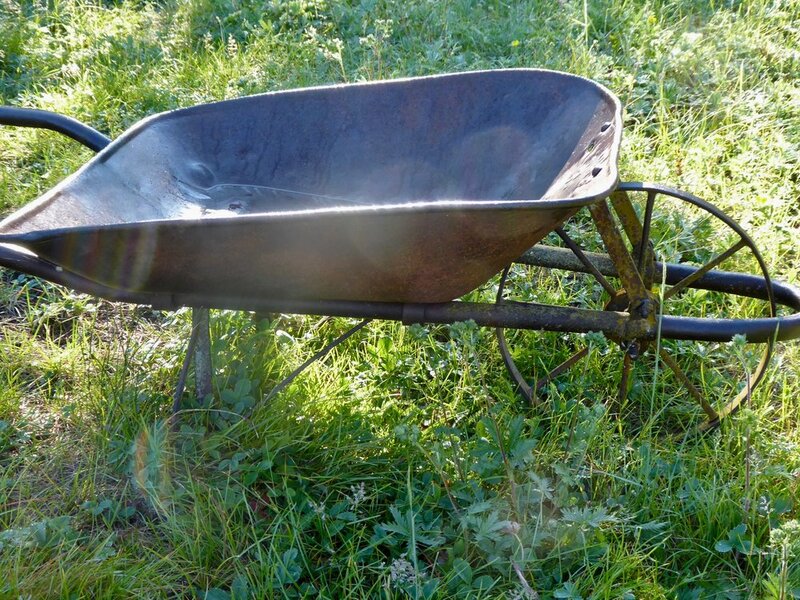 An old wheel barrow shows good use of what one had. Lots of high cliffs adorn the river banks today. This section makes paddling easy. when we take a food break our canoe continues to move down stream,! So easy to check out the view! Our beautiful campsite was hard to leave, but I was up at 4 and had made tea and pancakes before waking Don. It was a chilly 38 degrees and there was a mist coming off the river when we packed up by 6. Needless to say one felt at peace before moving on. The river moves fast in this area. At one point we were moving at 9 miles per hour. The scenery continues to be spell bound especially the fireweed in full bloom. Burned over areas make way for fireweed. Never tire of this plant! Unlike previous days we have a destination to make. We plan to camp at the Coal Mine Campground. We arrive about 1 pm and are surprised by all the activity. This though is short lived as either folks are taking out or putting on the river mainly heading to Dawson. Soon we have the campground mostly to ourselves and are able to take showers, do laundry and catch up on emails. We take advantage of the large ice cream cones and watch the river keep moving. It is the hottest day yet as the temperatures reach 80 degrees. As we check in for the night, more groups arrive and there is an excitement in the air. Lots of people are ready for an adventure. This next section has the only major rapids on the river called Five Fingers. As usual we were up at 4 and had our boat loaded by 6. It was a bit tricky to load the boat from a dock with a strong current trying to push the canoe away, but with persistence we accomplished this task. It was interesting loading the canoe this morning. We were greeted by a beautiful sunrise. We have been told that there are major fires burning to the south. There is a red haze to the sun. The river continues to widen. 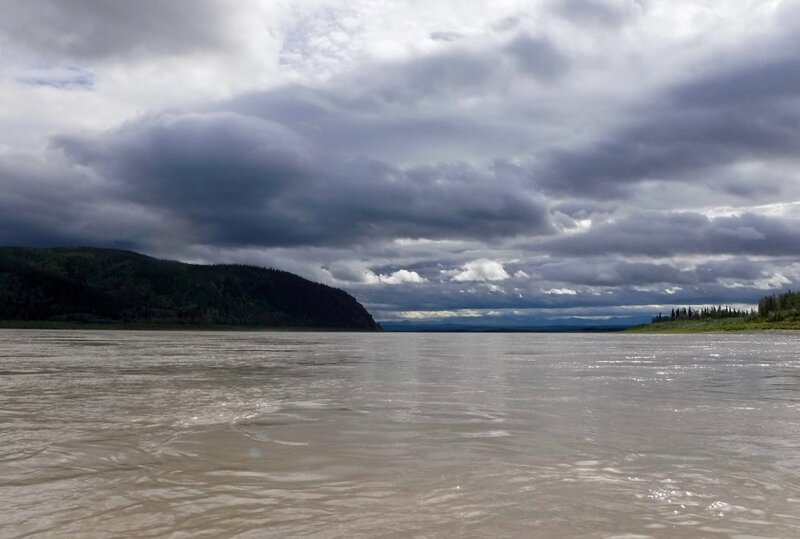 Today we will run the major rapid of the Yukon River. It is called Five Fingers and was a major threat to steamboats. On the right side channel which is the one we will take there has been numerous rocks dynamited out. This has made for much safer passage. Before long we see the row of rocks that announce the rapids. We work our way to far right. Above the rapids is an observation deck where people can gather to watch boats go thru this section.. The difficulty of this rapids is dependent on water level. It doesn't look too bad today and we line up for a straight shoot. The standing waves send some water over our bow, but with our spray deck we don't take any in the canoe.. On the rocky cliffs there is a cable that was used to pull the steamboats up thru the rapids. It is hard to imagine this activity as the current is quite forceful here. The rocky pillars let us know that we are approaching the rapids. Fortunately it was a fun ride, not filled with too much adrenaline. The river continues to widen as we work our way down the river. The scenery continues to change. 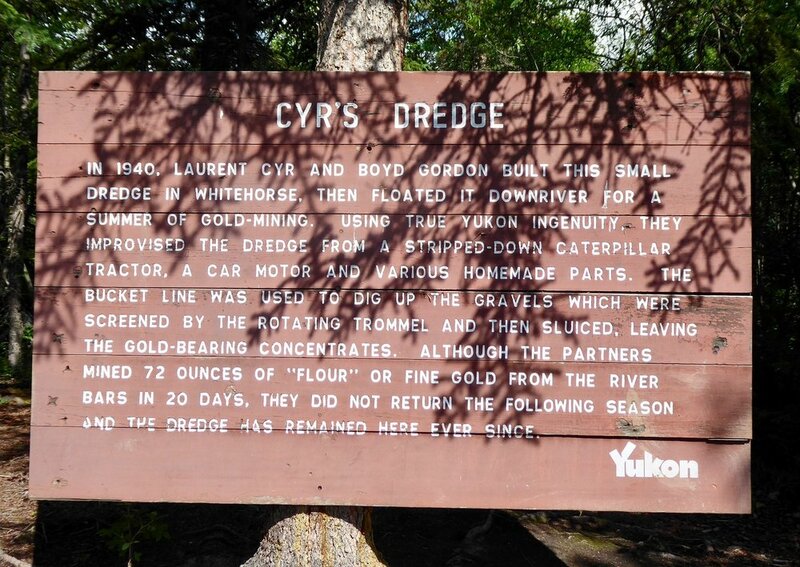 We pull into a site called Yukon crossing. The sign gives us the history. We have lunch next to the old roadhouse and once again imagine the activities that took place here. Next stop is Minto crossing. As we approach a pull out to take a break, a ferry that is bringing a truck filled with ore starts across.. It is a true ferry as the captain angles the barge to land where we were stopped. As we hurry to get out of its way the men on board motion for us to stay. One can tell that the Captain has the ferrying skill down. As we wait a man gets off the boat carrying a jacket. He tells us that a group of Boy Scouts were here yesterday and were stopping at Fort Selkirk. He wanted us to take the jacket down river which we can easily do. After the boat returns to the other side we take our break and once again check out some of the ruins. A raven perches on one of the old log cabins. I don't think that there has been any trip that the Ravens have not had a presence. 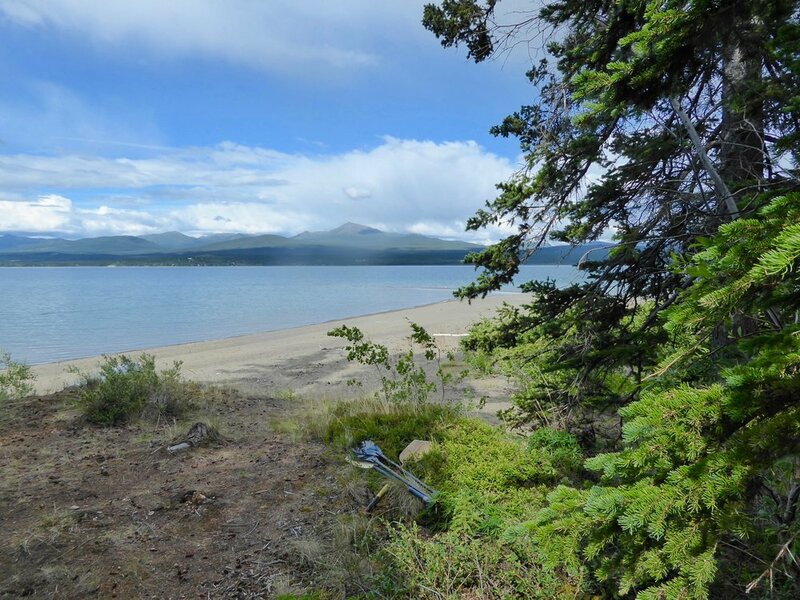 The guide book informs us of an excellent campsite that is also the location of Thoms cabin. We have made good time today and decide to stop early. The cabin is in great shape and one could probably sleep inside, but after reading that the owner of the cabin was found dead inside, we opt for setting up our tent. The roof is made out of interesting material. We sleep soundly in our tent! This section of river continues to have remnants of history on both sides. We read historical accounts as we take turns paddling the canoe. It is another morning of a red sunrise. We are fortunate that the Yukon is not burning, but feel sorry for the people in Brittish Columbia. A sign on the left bank lets us know that we have arrived to Fort Selkirk . A sign gives us the history of the area. We find it interesting that this area has been used for over 8000 years. First by the First Nation people who traveled many miles to trade at this location. A map showed the many areas that they came from to trade. We marvel at their ability to travel many miles under their own power in a variety of conditions. Fort Selkirk has a large space for camping surrounded by numerous buildings that are being restored. One can once again walk thru the buildings and imagine life in the 1800's here. We approach some younger campers and hand over the jacket that we had been given yesterday. They immediately know whose jacket it belongs to. With that task done we take some time to check out the buildings. Many of the structures have sod roofs. Two small churches were located here. One was a Catholic Church and the other one an Anglican one. Neither held many people. The inside of the church was well restored. Winters would be quite cold here so we were sure the large stove felt good. Behind this church was a First Nation cemetery. Soon it is time to go and we appreciate this sign above one of the buildings. The temperature is dropping and we both are getting cold. We head down to the canoe. Since most of the time our photos are taken with the spray deck on we took the opportunity to show how our canoe is loaded. We are looking forward to sending our backpacking gear back to our home once we reach Eagle. Everything fits thankfully. Our last highlight of this day was a mountainside filled with mountain goats. One of our guidebooks mentioned that we should look for goats in this area and it was good advice. After leaving the Fort, Don begins to feel ill and we are glad to find a nice place to camp. He retires to the tent. I spend a quiet evening enjoying the sun, sitting in a chair that most likely has stories to tell. Fortunately Don woke up rested and after a pancake breakfast was ready to go paddling. The current was moving us right along today. We passed a large grizzly bear sunning itself on a rock, and a moose cooling off in the river. We saw signs for a bakery, but missed the opportunity to pull off. One needs to plan ahead or stopping where you want to be may not be an option.. The river continues to pick up side rivers and the color of the water is a true coffee color. We pass by two men camped by the shore. They invite us in for a cup of coffee and some good conversation. We learn that they have camped a couple of nights with the men from Germany that we had met on the Chilcoot trail. In fact they are not too far ahead of us. These men plan to take several slow days in order not to make it too soon to Dawson, where they are ending their trip. We, on the other hand have barely begun our trip. Lots of miles still to go! 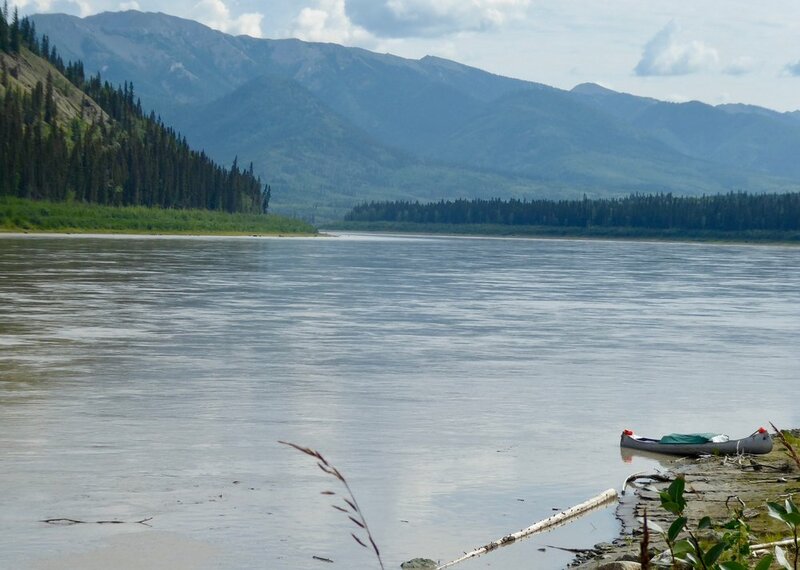 When the White river joins the Yukon, the wind picks up and we fight our way to the shore. Rain starts falling and we set up our tarp and then as suddenly as it picked up the wind dies. It is still early so we take down the tarp, pack up and continue to head down river. The river widens and we find ourselves choosing channels. Campsites are harder to come by and we start looking for large gravel bars. Eventuallly we find an ideal one that has no bear tracks. This is our longest paddle of the trip. Below is a typical river vista. We are almost too tired to appreciate our surroundings. We were up by 5 and were greeted by calm weather. If the weather pattern holds we should be to Dawson by mid afternoon. It is quite calm and the current swift. Don and I switch places every day which is good for our relationship. 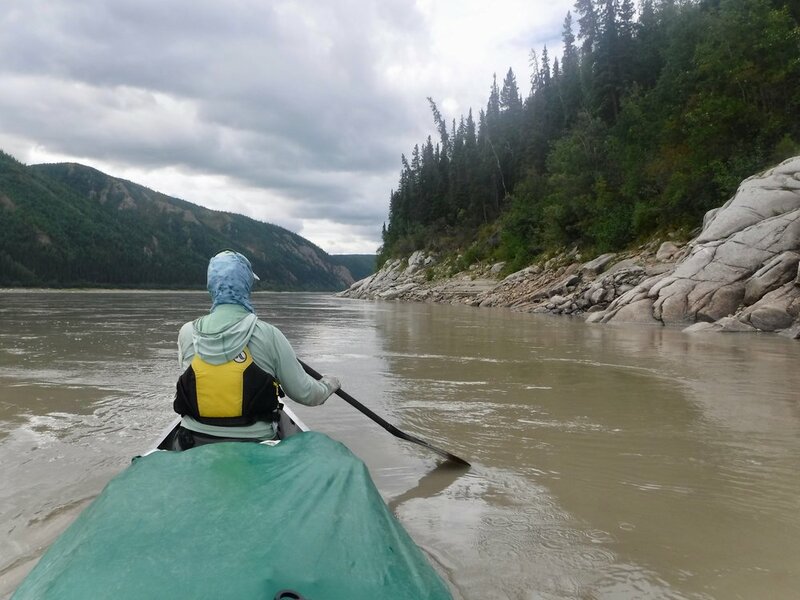 More rivers join the Yukon and route finding becomes more interesting. Every channel will get us to Dawson, but some are quite a bit longer. We are glad for the guides that help choosing which channel. Soon we can see a large slide in the distance which indicates that we are nearing Dawson. 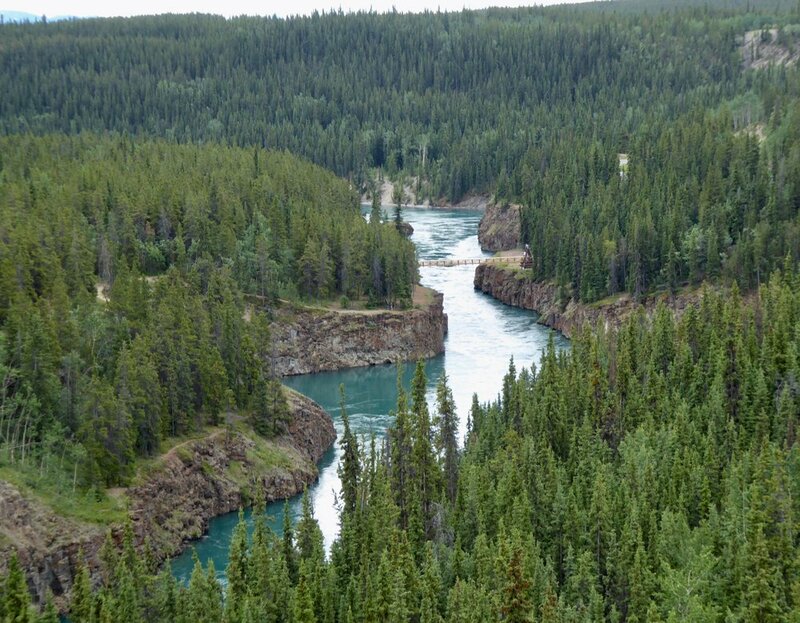 Just above Dawson is the Klondike River which is where the miners were heading to make their fortune. The First Nations called this river Thronduick which meant hammer-water. A name derived from the First Nations hammering stakes into the water to make salmon traps. By the time the miners got here most of the claims had been staked and they began looking for ways to return home. Today Dawson is a tourist town and the take out for the majority of canoers that are coming from Whitehorse.. There are three main large boats on the river, the first one is the replica of the steamboat Keno. The second one is the ferry which during the summer runs 24 hours a day. This enables drivers and walkers to be transported across the river. 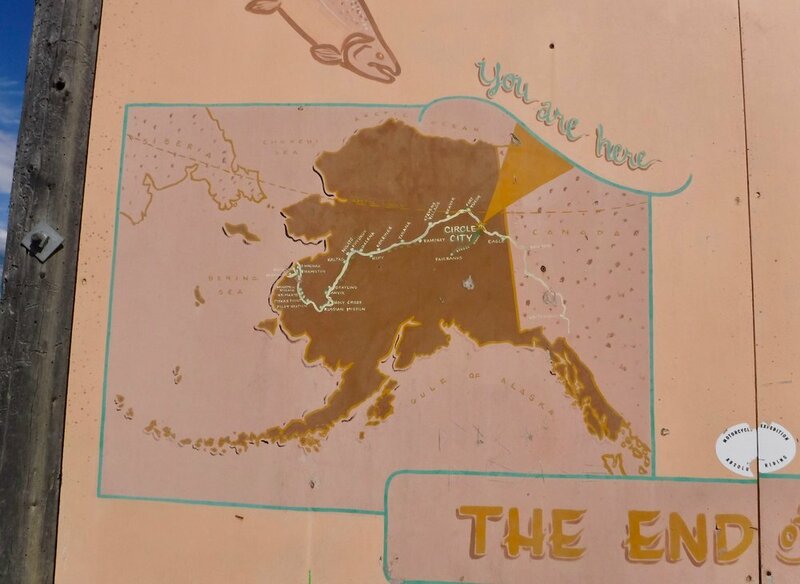 This connects Eagle Ak to Dawson via the Taylor highway. The last boat on the river was the paddle boat taking tourist up and down the river for a taste of history. A beautiful evening for a boat ride. 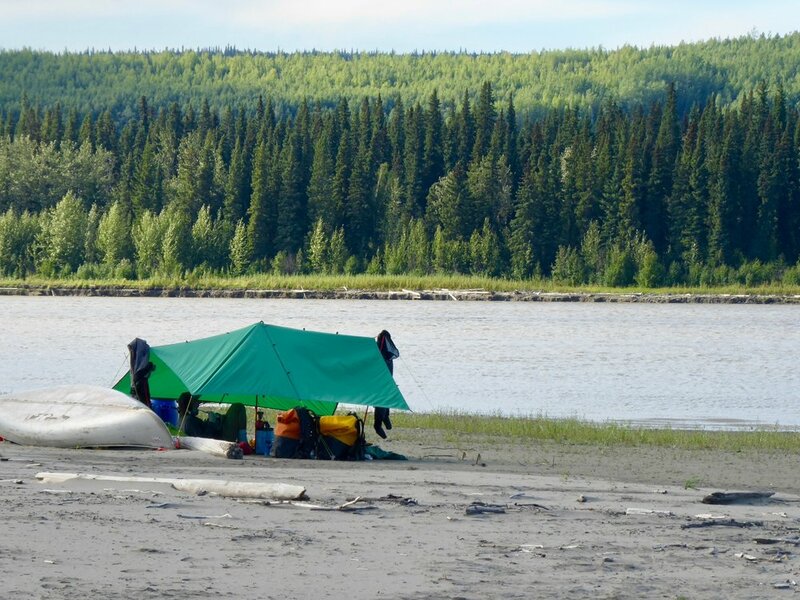 We were able to find a camp site next to the river, however it had quite a steep bank which made for an interesting challenge to get our gear to the site. As soon as we had the tarp set up, several rounds of thunder and lightning were followed by a massive downpour of rain. We were quickly able to fill all of our water droms with rainwater. After the rain storm Don headed over to Dawson while I stayed back to organize our food. We will be getting resupplied in Eagle and since we are traveling quite a bit faster we have an excess of food. Most likely we will be sending some back to Palmer..
Dawson is the last major town on the Yukon that we will encounter with road access. After a great breakfast of pancakes and a recharge of our devices in the washeteria, we were loaded and pulling out of Circle around 8:00. We checked out the sign one more time and thought we have a ways to go! This next section is called the Yukon Flats and we soon could understand how it got its name. Not much relief and the Yukon widens with many channels to choose or get lost. We had topo maps which were good for the overview, but for the details we were relying on Gaia, a program we had put on our devices. Gaia showed us our location and generally the most efficient channel. Each year the Yukon changes its path and sometimes Gaia showed us going overland. We could easily understand how steamships could become grounded and be destroyed. There was some current, but at times it wasn't exactly going where we wanted to go. There is a lot of water flowing and even if the current wasn't real strong it is difficult to go against it. This is our view and we had to figure out where we wanted to go. Today we wanted to avoid an area known as the whirlpool. The directions were to stay left or risk being in an area that could potentially keep you going in circles for half of a day. We might have taken these directions too literally as we found ourselves in a very small channel that had very little current. When we tried to get back to the main channel we actually had to line our canoe up a slough that was going opposite of the current. Fortunately we were able to walk along the side. Looking at Gaia and the topo map we determined that we had made it past the Whirlpool section and it would be good to look for camp. From here on out we will be mainly camping on gravel bars. First we check for bear tracks and if they are absent we look for level ground to set up our tent and kitchen. Took us awhile to find a spot, but we finally found home! Another day of paddling the flats. Several motor boats have gone by today. We note their route, but they quickly disappear from sight and we are back to Gaia and topos for route finding. The view is similar to yesterday. I find that if I look straight down from the boat all one sees is the brown color, but in the distance it seems more blue. We are listening to audible books. Jeff, our son bought us a water proof speaker which we put on the deck between us. Listening to the books is a great added addition to our travel. 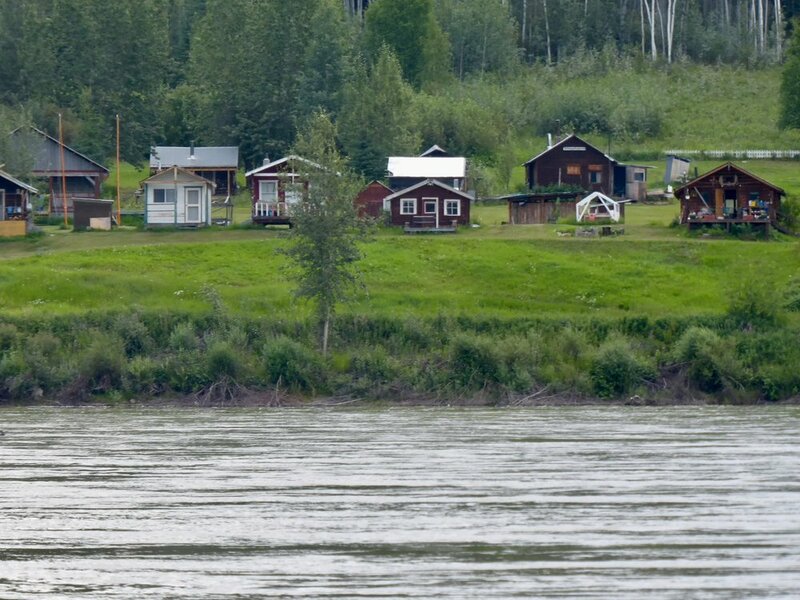 Today we paddled north of the Arctic Circle and reached the town of Fort Yukon. Don headed into town to see if we could get some fresh produce and water. It was a decent size store, but quite expensive. A gallon of water was over $8.00 and two oranges were over $5.00. We ate the oranges slowly to savor the flavor. A couple of men from the town welcomed us and tried to sell us some frozen salmon which we declined. It was still early in the morning and they already had been drinking. Fort Yukon is the furtherest North we will be on this trip. Soon our bow will be pointing South. We pass a barge that appears to be stuck on a sand bar. It is slowly trying to break loose. A motor boat seems to be looking for a better route for the barge. We are glad that the draft of our canoe is minimal. Once again we find a gravel bar and put up the tarp. Today it is for shade as the temps are quite high. We are now using our canoe as the anchor for one end of the tarp. We like this method. Even though there are no bear tracks around, we still try to set the tent away from the kitchen area. This area is known for thunderstorms and so far we have not experienced any. We are enjoying the cloud formations. We were up by 4 this morning and had a breakfast of banana pancakes, thanks to the store at Fort Yukon. Life is a paddle rhythm now. Stroke by stroke! Smell of fire was in the air. Glad it seemed small. Today was a hot one, most likely the hottest day of the trip. It felt good to take a float break and watch the shore go by. Lots of charging the devices today. We passed our first village since Circle. The town of Beaver, is off the road system. We missed the channel that heads to the village so we were only able to see it from a afar. We decided to make camp just past Beaver. We stopped with plenty of sunlight left and set out the solar panels to do some charging. We are quite impressed with the tent stakes we are using! We even painted them orange and made sure we counted them each morning. Gravel goes deep and the tent stakes work great. Another nice campsite to enjoy the evening! We have been getting up right before sunrise and getting on the water within 2 hours. Somedays are a little faster, but it almost seems regardless the time works out to be the same. We keep waiting for the afternoon storms, but so far they have not come. The days are just beautiful with lots of cloud formations. We never tire of looking at the skies. At times we felt like we were paddling on a large lake. Don thought that this area reminded him of the plains or the prairies with water instead of land. Again we are thankful for Gaia so at least we know where we are. The topos are good for an overview, but not so good for the exact location. We have passed several canoe groups today. Most of them were on the shore and the only contact was a wave. With the Yukon having so many channels it is quite easy not to see other boaters. It was a good day of paddling and it felt good to make camp. Time to take off the paddle pants and enjoy the sky once more! It was a 10 star sunrise today. We are close to Steven's village where we hope to fill up our drinking water so didn't feel the need to be on the water so early,. And then it was pure gold as the sun rose higher! Soon we were loaded and on our way to the village. This was another location that if we missed the channel we could not make it to the village. We carefully followed our maps and soon saw some cabins that were on the outside of the village. 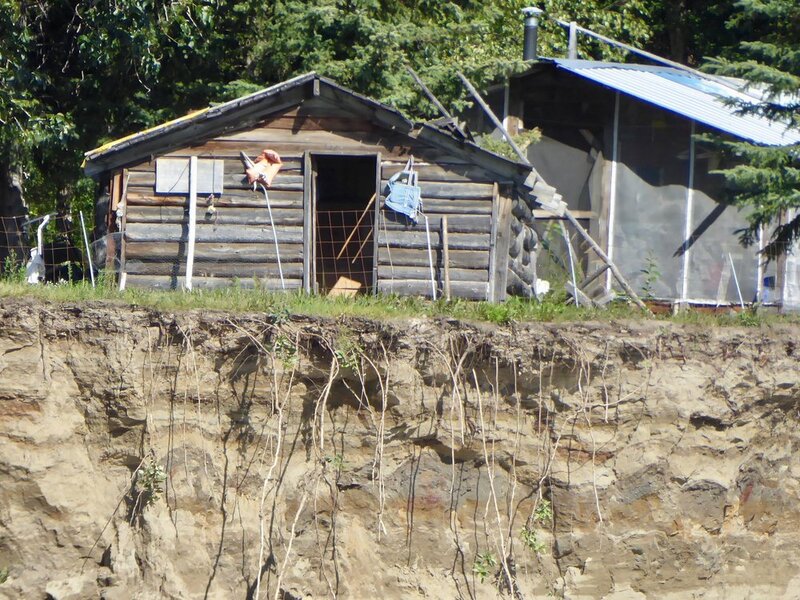 The Yukon has eroded a lot of the banks and several of the cabins were in danger of being taken by the river. Several had ropes or ladders that helped them get to the water. 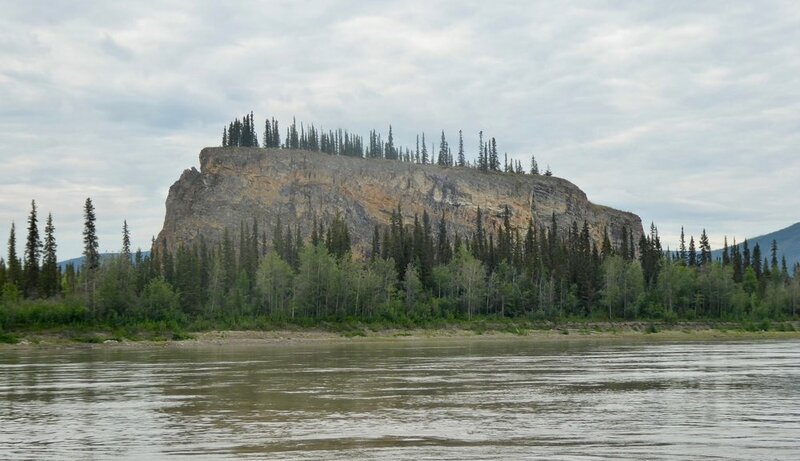 Banks of the Yukon are continually falling into the river. No wonder the color of it is so brown. We pulled into the village when we saw the first row of boats. Don went on a water scout and after finding someone to ask was pointed to the water distribution building. It was a do it yourself, just push a button and out comes the water. It wasn't long when we were back on the river. Glad we stopped when we did as the town stretched out for a mile or so. Getting back to the main channel was more challenging. We took a slough only to find the current was against us. Rather than doing a lot of backtracking we decided to do some lining. 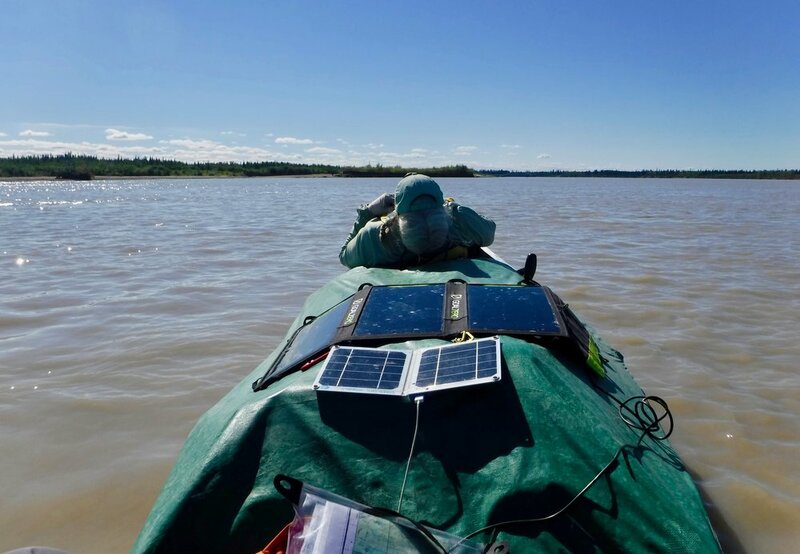 That worked till we had to get back into the canoe and paddle quite hard till we joined the main current once again. 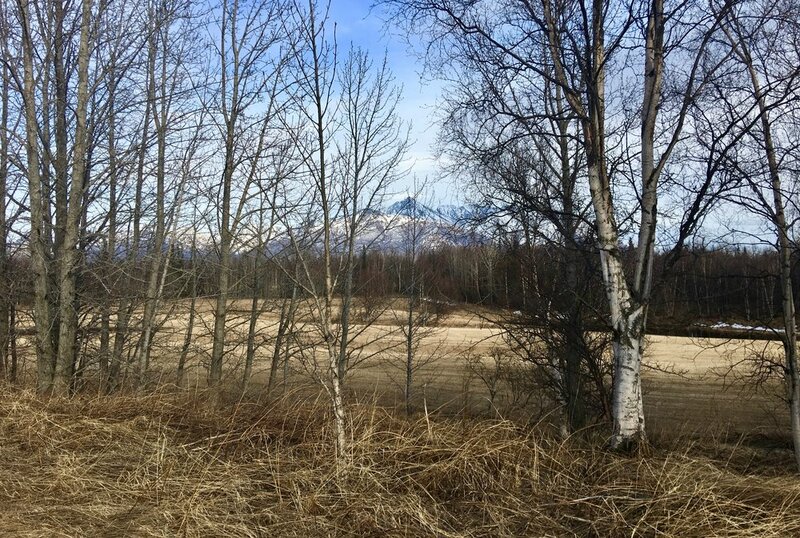 It wasn't long till we saw the Alaska Pipe line and the Haul road in the distance. This is the third bridge that we have gone under since starting the trip and it will be the last one on the river. There is a small restaurant and hotel here. We plan to stop and see if we can get some emails. A close up of the pipe line. Don went up to see about emails and showers. Showers were fifteen dollars a piece so decided that we were not that dirty. He was also successful in getting a batch of emails. One of which told us sad news about a friend from many years ago who had fallen off a roof and was not expected to live. That kind of news always puts difficulties in perspective. Earlier in the day we thought about camping here, but it was quite noisy and not how we wanted to spend an evening. Donna had a nice conservation with an older Native women who had just returned from her fish camp. 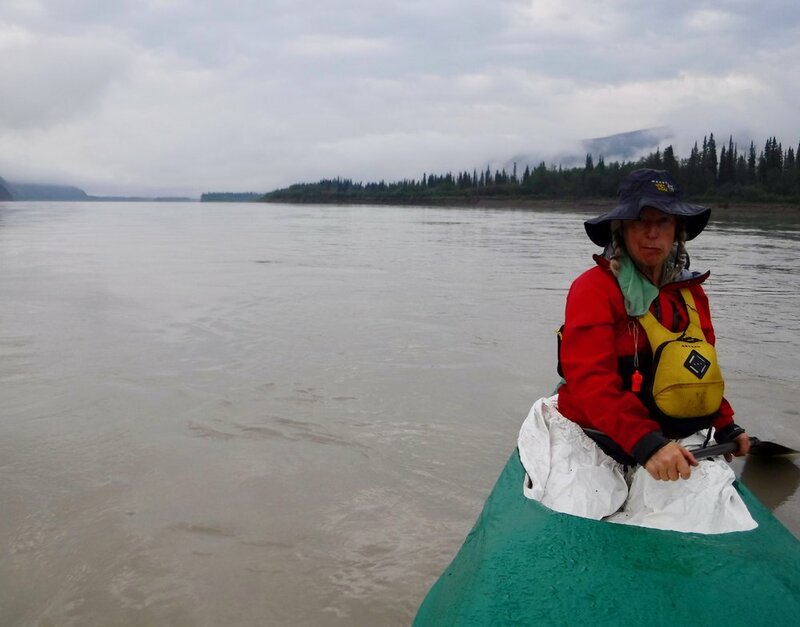 She told her about her father that would paddle upstream to Fort Yukon in his birch bark canoe. When one first crosses under the road and looks back the river is quite wide. Quite the engineering feat to build the bridge and pipe line. The evening is quite nice with no wind so we took advantage of the conditions and headed down towards the canyon. We are leaving the Flats and heading into a more mountainous area. It had been a long day yesterday and when the sun rose, we were still enjoying the comforts of our sleeping bags. In fact we did not get on the water till 9. Perhaps that is why Don has a big smile on his face. This section of river is quite the contrast from the Flats that we paddled thru last week. The section after leaving the haul road is known as the canyon. Strong winds and sudden storms have us alert for changing weather patterns. Today though as we load our canoe, the river is quite peaceful and the temperatures are hot. Hardly looks like the same river that we started on 3 weeks ago. We take advantage of the calm day to listen to more audible books using our speaker. Todays book was written by Jimmy Carter when he turned 90. One take away for us was that you should love God and the person in front of you. We were impressed by the life that he led. We are also impressed by the mountains that surround us. Every bend in the river has a majestic view. We are passing by more fish camps. Several are occupied, but more are vacant. We are between salmon runs. Word has it that the King Salmon run was the best one in 6 years. In fact in previous years very few King salmon had made it into the Yukon. Our pace has noticeable slowed. The current is still here, but not longer can we float during our breaks and still make much progress. We find a beautiful campsite and enjoy the views. 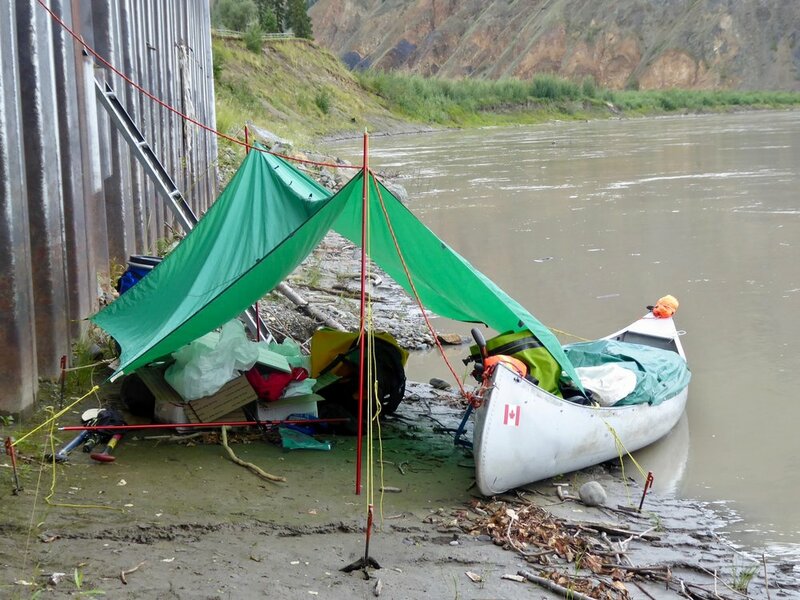 The level of the River provides many opportunities for campsites. Earlier in the year this one would have been covered with water. We were back to our routine of getting up early and being on the river by 7. When we rounded the bend we saw the small village of Rampart. Hoping to fill our water containers here we stopped and Don checked out some of the buildings. No one seemed to be around so headed downstream. We passed some more houses but there was not much activity. Must be a good day to sleep in. There are more darker clouds today and the temperature is cool this morning. Our crux of the day is going past some rapids. Although with the river level we don't imagine that it will be much of a concern. Once again we are impressed with all the mountain ranges that we pass by. A group of dogs were tied close by. They seemed quite well fed living on a fish diet. The rapids were a non issue. It was an easy paddle around them. At a different water level we could imagine that they could be more of a challenge. The rocks in the middle were all exposed. Camp was made and we dried out some of our gear. I was up at 4 and we were on the water by 6. 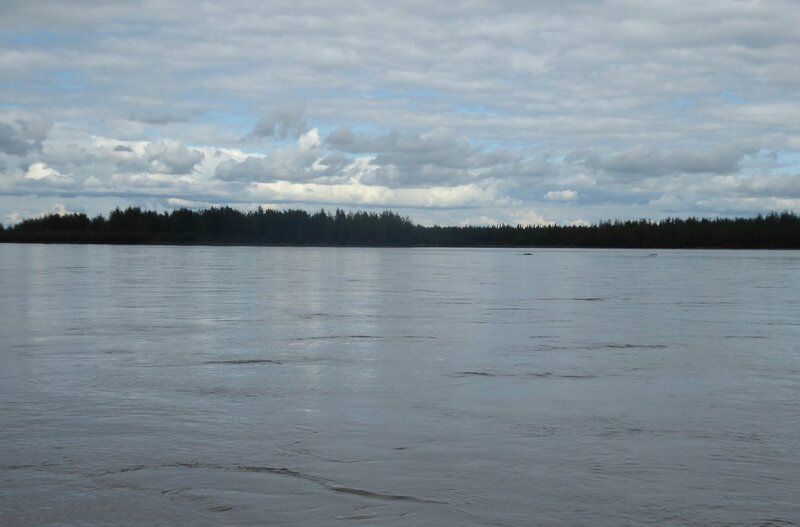 Today the Tanana River joins the Yukon and we are out of the Canyon. Didn't think the water could get much browner, but it does. It also begins to widen once again. This will now be the trend as more rivers add to the volume. 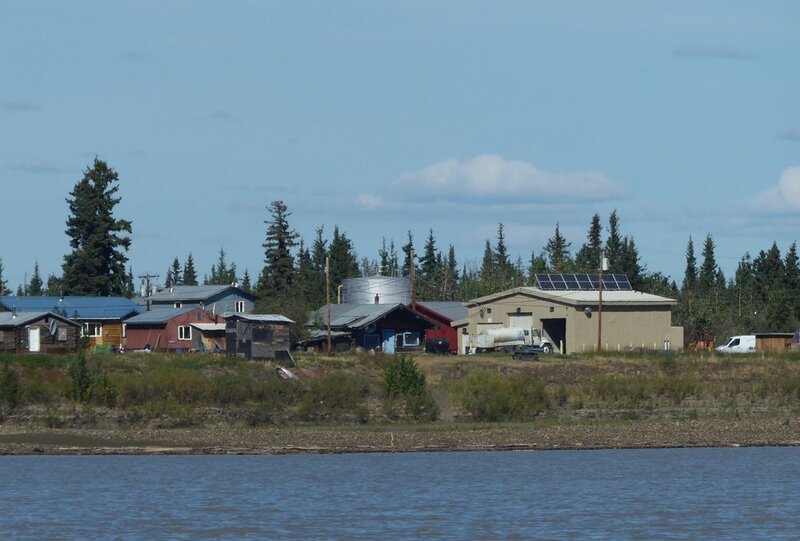 Soon we pull into Tanana, where Don hopes to get water and maybe connect to the internet. A small grocery store provides him with two apples, some crackers and water from their sink. The washerteria is closed today so no showers or laundry today. There is cell service in this part of the river, but you must have GCI. Our provider is not a partner so once again we are not connected to the outside. We are carrying a satellite phone so if an emergency arrises we do have a communication device. It is raining on and off today. We have brought our heavy duty rain gear and wonder if we will need to pull it out. One of the reports that we read about traveling this section commented that one will need to be accustomed to being cold and wet. This church was located on the Main Street. We park our canoe next to some of the river boats. There does not seem to be much activity here in the town. Also outside of town are a collection of fish wheels. They appear to be in all shapes and sizes. Some look to be commercially made while others are hand crafted. Some fish wheels are in the water, but it seems in this area more have been on land. The weather is definitely changing. During the night the wind blew quite strongly. There is not much protection when one is in the middle of a gravel bar. I got up once to give a quick check of camp. We are so pleased with the tent, it held up well with the wind's strong gusts. I was more worried about our 11 ounce paddles from Werner. It wouldn't take much for them to get caught and be blown. My simple solution was to bring them into the tent with us. We had spare paddles, but it would be a whole different feel of paddling. The rain came down, but mostly it was being blown horizontally so could not get any for the droms. We thought perhaps that this was going to be our first entire layover day, but by mid morning the wind had died and we were able to pack up and head downriver. We had our first good bear sighting when a sow and her cub came out to the shore to get a drink. They did not notice us at first and shortly after drinking started to cross in front of us. The river was pretty wide and it would have been a long swim. Reinforced our knowledge that islands are not safe from bears. It was pretty cute as the cub was swimming right behind Mom when all of a sudden he got wind of us and reared his head out of the water. The cub quickly alerted Mom to potential danger and they turned around and made for shore. Upon arriving to shore Mom stood up, gave a quick look and was off into the woods, followed by her cub. They were into the trees and out of sight pronto! The rain was a big tease today. It was enough to need a rain jacket and then it would clear up and then back to rain. Glad that our speaker was waterproof. We listened to the book "Heroes" today. We decided to call it a day around 4 as there was a break in the weather. We set up camp and had just tied out the last stake when the skies let loose and the rains came down. Glad to be here and mostly dry! The rain poured all night, but glad to say we were so dry inside our tent. I am now making it a habit to sleep with the paddles, so one less concern when the wind blows up a gale. We took a leisurely morning hoping that we might get a break in the rain. Sure enough around 9 the sound of rain hitting the tarp abruptly ended. We did a quick dash and were able to get everything loaded before it started up again. Overcast with hard rain was on the menu for the morning. Had most of our warm clothes on today. Took only short breaks as it was easy to get cold when one was not exercising. We were feeling that this was going to have a good outcome. A man called Shawn was working on his boat and invited us to head up to the main building where Carol, one of the Camp Directors was working. She made us feel most welcome and said not only could we stay there, but we could stay in one of their cabins. It just happened that the campers had left yesterday and a work group from Texas was arriving tomorrow, Our timing couldn't have been better. so instead of flat ground to pitch our tent we had a dry cabin to sleep in. Once we had gotten out of our wet clothes, Carol stopped by to invite us for dinner and to take a hot shower. These words brought smiles to our faces. We had dinner in the dining hall and were also able to check our email. This day was turning out well! Inside the building was Shawn's wife, Nicole and their 4 children. They had just made donuts which were made with bear grease. On the stove was mooseburgers cooking and for an appetizer it was whitefish eggs. Shawn and Nicole were helping Carol and her husband Roger with the camp this summer. Shawn and Nicole with their children had been. living a subsitence lifestyle 90 miles up a neighboring river. They plan to return there next summer. It was a dry and warm evening as we listened to the rain hitting the roof. Nicole was glad to get some relief from the gnats, which were quite fierce this summer. We haven't experienced many bugs yet, but if the rain stops sounds like we will Sleeping in a dry cabin was not how we envisioned this day to unfold. We are feeling grateful as we fall asleep. The rain had let up some so after a breakfast of cereal and homemade cinnamon rolls thanks to Nicole we packed up. A black bear had gotten into some of the fish that Shawn had been drying. The bear was hanging around the camp this morning and could not be scared off by shooting over it. We also learned that last night when a barge came to refill fuel at the camp, the bear had chased the workers back on to the barge. Apparently this has not been a good berry year and this bear had come down to the river in search of food. Unfortunately a bear with this type of aggressive behavior had to be shot. Shawn had learned that the large amounts of rain that had fallen was from a typhoon that had hit Japan. The weather forecast was calling for rain today, but not as much as the previous day. 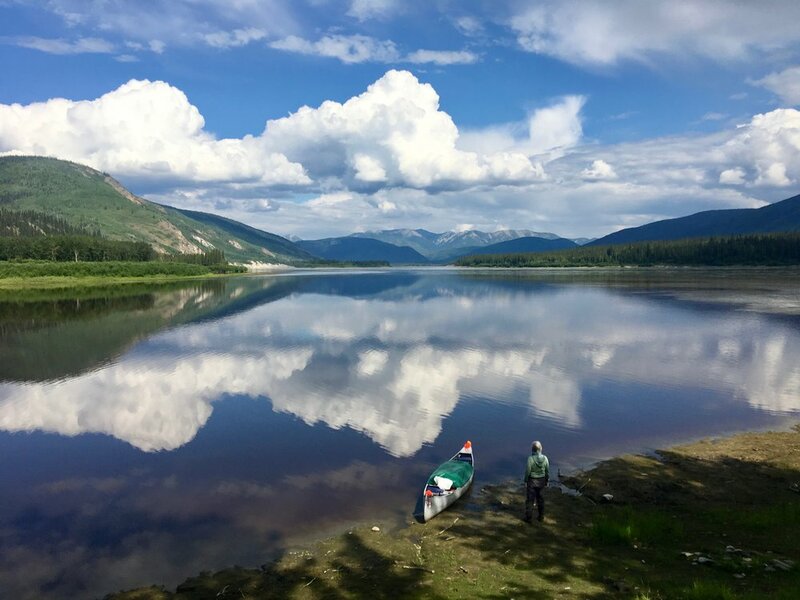 It was a very thankful good-by as we loaded our canoe and headed down the Yukon. It was an entirely different river today. The mountains were covered with clouds. After setting up camp we were fortunate to have the clouds rise and show off the Kokrine Hills. Sometimes we are able to use the trees as wind blocks. Today however there is no wind and the gnats that were absent during the rain storm are back in massive numbers. We retreat to our tent and watch the insects as they try to find a way in. We were awakened by a beautiful sun rise and mist coming off of the water. The mist definitely added to the beauty this morning. Today we paddled past the town of Ruby, We plan to be in Galena tomorrow so decided not to stop. We were also on the opposite side of the river which would have added miles to the travel today. The town is nestled between two hills. Loved the setting of this town. With clear skies, we decided to make camp earlier today and bake rolls and pizza. Tomorrow we hope to be near Galena which is where our next food drop should be waiting for us at the postoffice. If all goes as planned we should be to Galena by mid afternoon. The wind is cooperative and the sky clear. The rain storm is long gone. The only evidence of the storm is that the river has risen and there is more debris in the river. Our book today is Born a Crime by Trevor Noah. Audible is a great way to listen to books! Yes! This really is the Yukon. 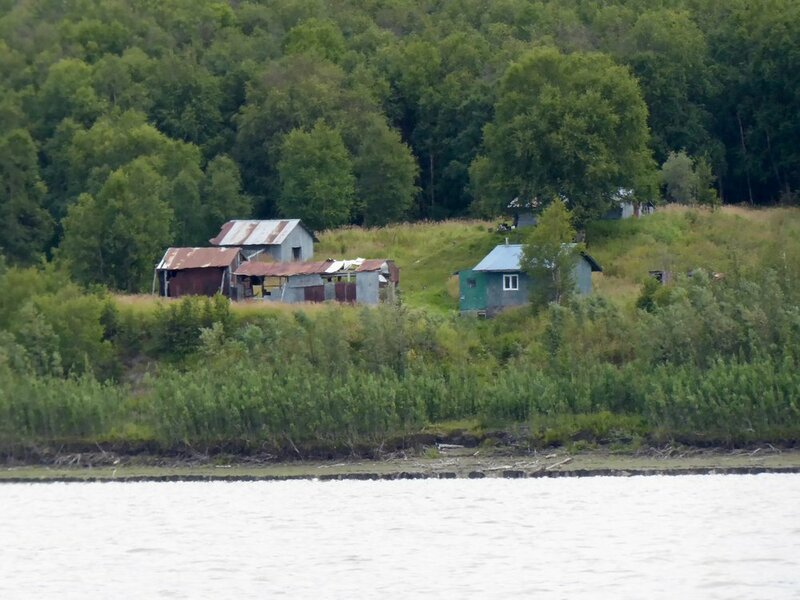 It is Sunday afternoon and as we near Galena, there are more fish camps. Most seem to be occupied. Quite a few look quite modern with solar panels and satellite dishes. Others look quite traditional. We notice that several have been burned. We soon find out why. Several miles outside of Galena, a motor boat approaches our canoe. The man at the motor tells us that a man known as Slop Bucket Jerry is suspected of burning several fish camps in the area. He may be traveling by canoe so anyone in a canoe on the river may be a suspect. No one knows where he now is so the town is on edge. We thank them for this news and continue on. On the outsides of towns that we are passing, there are cemeteries. When we see the white gravesite marker we know that we are getting close to Galena. Cemeteries are usually on a hillside right outside of town. From our map of Galena, it seems to be quite spread out. We know that the Post Office is in the old part of town, so ideally it would be nice to camp near there. The challenge is to find which part is the old part. In 2013 a major flood occurred here when an Ice dam on the Yukon broke. Half of the town was destroyed. Many people moved away and some moved to a new area of the town. We pull out at a boat ramp and take a look. The gnats are here in full force and it looks like if we camp here we may not be near anything. We decide to go further down and pass a bulwark similar to the one in Eagle. Looks like it had been damaged and was not protecting the town anymore. We see a small clearing above the bank and check it out. This seems like a good place to put up our tent. This spot was made for this tent! Don walks up to a nearby road to see if he can get directions to the Post Office. This first vehicle that stops asks him if he is Slop Bucket Jerry. This could be interesting. The man points out the direction of the post office and Don heads in that direction. He finds it and also a small grocery store that is open.. He bought several cold drinks which we enjoy inside of the tent due to bugs. We saw several people on ATV's that had bug nets on. We are wondering if we are into the buggy section that we have read about. Post office opens at 9:30 so will have a leisurely morning. It was a night of light sleeping. We were a little bit on edge with the knowledge of Slop Bucket Jerry and hoped that no one would check us out. There were cars driving by, but we were out of direct sight. There was also a barge that went by last night and the moon shone brightly in the door of the tent. I was glad when it was time to get up and make breakfast. We had about a mile to go to where we could land and go to the post office. At the landing a large barge was unloading equipment. The crew that we talked to were not appreciating all of the gnats. It seemed like Galena was in a boom era, perhaps rebuilding after the flood. The beach was quite busy with boats coming and going. Don headed up to the post office and returned with the knowledge that all five boxes had arrived. It seems pretty amazing how quickly they came from Palmer, till one realizes that mail comes in daily by plane. Not like years of past when mail came by steamboat or dogsled. The gnats made organizing our food not much fun. We quickly shipped back a couple of boxes and packed up the rest. Our other task of the morning was to find where we could get water. I asked a man by the beach and he said this was my lucky day. He delivered water to houses and had his truck parked above the beach. I grabbed the droms and soon they were all filled. Now we are back into an area known as the Yukon Flats. The river spreads out and again can go in a variety of channels. A large hill called Bishop Rock helped us to head in the right direction. The river funnels some past the rock and when the salmon are running there are lots of fish wheels in this spot. We went by a tiny settlement that was slowly being eroded into the river. It has been here for many years, but some of the cabins may not be here much longer. The river continually erodes the banks, often sending large chunks of debris into the river. Campsites are taking on a new character. The gravel bars which we had come to appreciate are now sand bars. Sand bars that can extend for miles. The topography is very flat and we are aware of not needing the river to rise much before flooding our site. At least with all this sand, tracks show up very well. The majority of which are moose tracks. 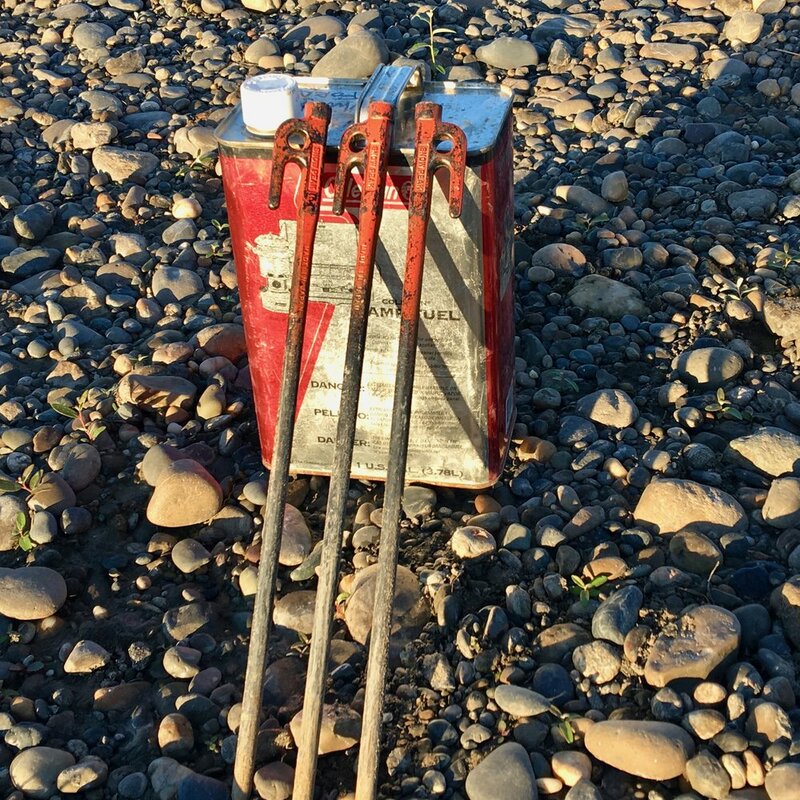 Tent stakes are easily able to be put into the sand. There are definite different kinds of sand. We will have to experiment which ones are the best for putting the tent on. 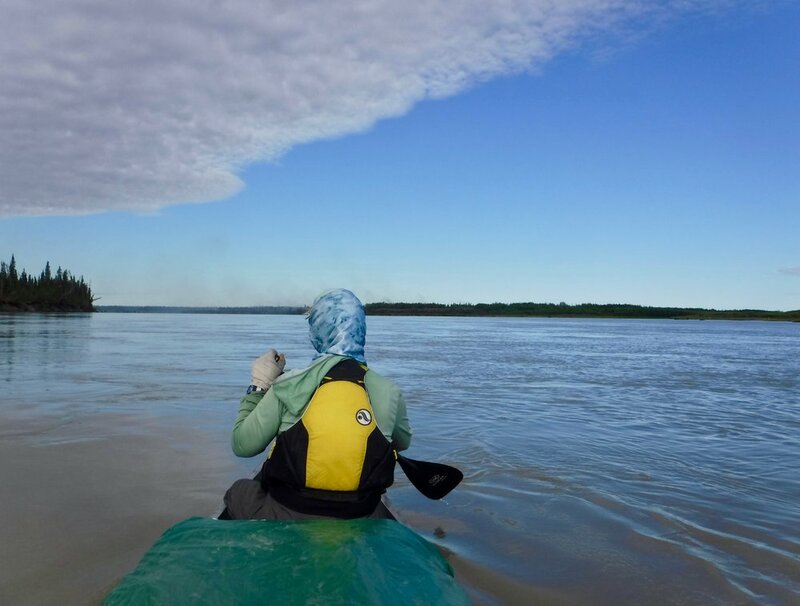 Today we paddled past the Koyukuk river which flows with a clear color into the Yukon. 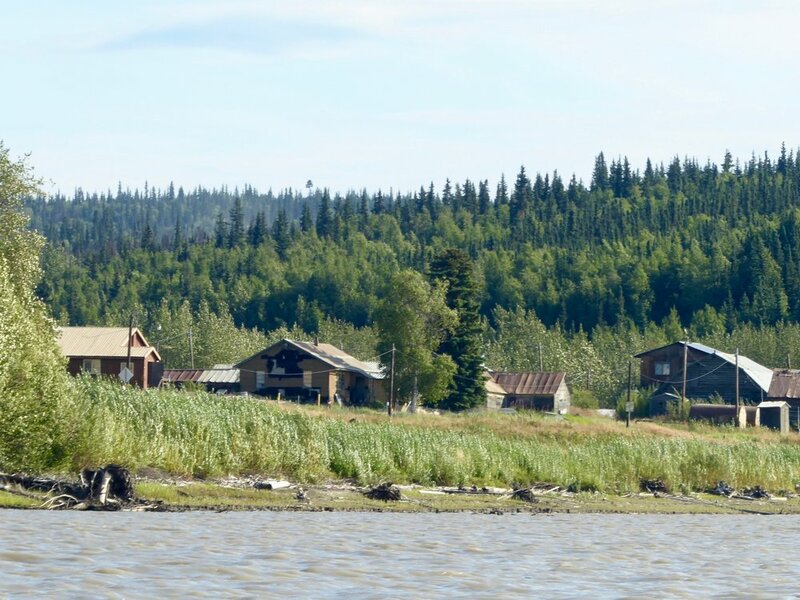 Upstream a ways is the town of Koyukuk, didn't really want to paddle up stream so passed on by. 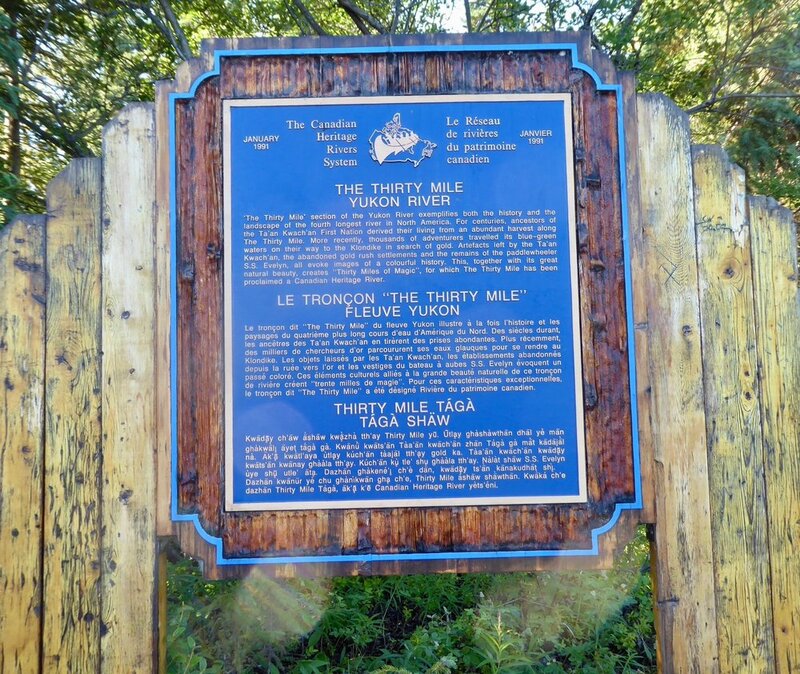 One of the books that we had read about the Yukon said that near here is the Last Chance Bar. Supposedly the last place one can buy alcohol from here to tBerintg Sea. We didn't see it, but really were not looking for it. Each village makes their own decision about alcohol. We also met the man who told us about Slop Bucket Jerry. He was coming from the town of Koyukuk and wondered how we were treated in Galena. 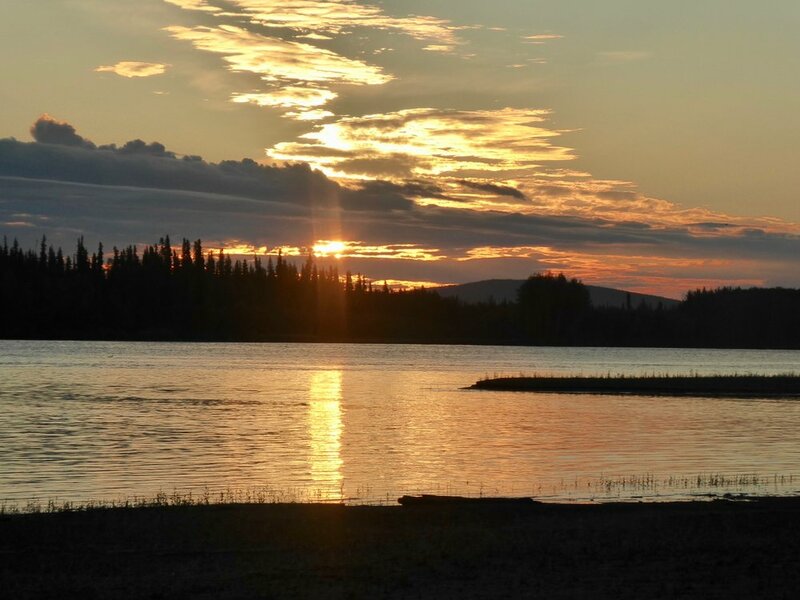 He also said that more boat traffic than usual was due to a funeral in the village of Koyukuk. It was another morning of dew, but the gnats must have gotten their wings wet as well. They were not quite as active. The other reason of their inactivity could been because of the moon. It was so bright last night that they might have stayed active all night. Love full moons. The sunrise was another stunner! Nulato This is the old part of town, newer buildings are in the back. There is also a brand new school being built. Often the largest building in the villages are the schools which are also a center for meetings. Right past Nulato the winds started blowing hard against us. Since we were not making any forward momentum we decided to pull off and take a break. The wind would keep the gnats away. When there are whitecaps being formed, it is time to take a break. We both took short naps and when the gnats came back it was time to get back on the water. We found a nice gravel beach and set up camp. No complaints with our home tonight. We awoke to peregrine falcons screeching over our tent. It seemed like there were two adults and two young ones. A large stack of trees near our tent appeared to be a perching spot. Don't think that they liked sharing the area with us. It was another beautiful sunrise this morning. The falcons liked perching on the top branch. As we head down river there is a certain pattern to the topography. In the distance we will see a mountain range with ridges coming towards the river. As we approach the mountains we will come to cliffs that we pass and then see another one in the distance. It is great to see so many peregrines on the cliffs. Not much current here, but it picks up some when we get near to the cliffs. The village that we stop at today is Kaltag. This stretch of the Yukon is where the Iditarod sled dog race takes place. It has been great to connect names from the race to actual places. Many boats are anchored in front of the village. Don heads into town to look for a place to get water and maybe internet. He stops at a large blue building which is a fish processing plant. The men working there are quite friendly and invite him in to get water from their sink. They tell him there is not much here in the way of grocery stores nor any internet services. They, however, have internet in their office and let him use it to download our emails. It has been a good year for Chums coming up the river. They are currently busy processing fish. Down at the beach a larger motor boat goes up and down the river getting fish from the fish camps and delivers the fish back to the processors. The men ask Don if he has seen Slop bucket Jerry. They say that this is not a good year for canoers on the river. Don't think we will be stopping at any fish camps. Many of the buildings near the beach have fish drying. This has been a great day to paddle. There is no wind to fight against and on the river the gnats are almost non existent. We are always surprised that once we get several miles past the villages, the boat traffic drops off considerably. It is rare to have a boat come near us. We always wave when we do see one and get a wave back. One definitely feels quite alone on the river. 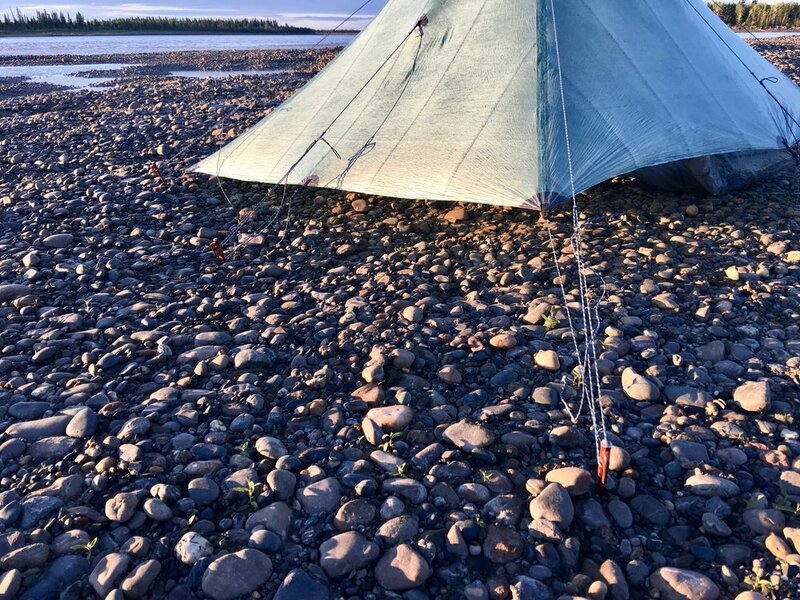 We have not seen any gravel bars to camp on so decide that a sand bar will be home for the night. We had stopped earlier at a stream and had noticed lots of bear tracks, so were glad to see none here in the sand. The gnats hitting our tent sound like a down pour. We are hoping that the wind doesn't pick up tonight. If it does we are going to be sandblasted. Considering how slow the current seems we are satisfied with the milage we have made today. Our hopes of it not getting windy were dashed when we were awoken to our tent shaking and sand hitting the sides of it. I took a look out of the tent and saw that the tarp was faring well and there was not much we could do but wait it out. In the distance we could see a wall of water coming our way. The wind was blowing so hard that when the rain did hit us it was horizontal. The tent got 5 stars for being so stable. I scurried out of the tent and lowered the tarp as much as I could. Lots of wet sand covered the items under the tarp. During lulls in the storm we were able to eat a quick breakfast and then retreat back to the tent. We both took a nap and figured that this might be a true layover day. By early afternoon though the front had passed and the wind had died. The sun even came out, and since we were still having the long days of summer we decided to continue on down the river. Our tent was surrounded by sand that was picked up by the wind. By early afternoon the seas had calmed and we were able to shake the sand off our our gear and continue on. This was a surprising turn of events from the morning rain and wind storm. We often rely on our nowcast of the weather to determine our agenda. It is a go! No storms during the night and another morning of great light. We never tire of the sunrise! This was a morning that the light continued to make us take notice. The wind was steady today, that is it was steady against us. We even pulled over to take a shore break when we saw a squall approaching. The river is so wide that we could see it hitting the other side. We managed to stay dry. Today was work for every stroke. It was too windy to listen to our book and really too windy to carry on a conversation. By hugging the shore we were able to move forward. We have added layers today and we are wondering if summer is over. We often hear the booming sound of dirt calving into the river. We passed by several fish camps today, but only will stop if we have a safety concern. We found a nice large island and made home for the night. Never tire of the ever changing scenery. If the word for yesterday was wind, it is the opposite word today The word is calm with heavy rain at times. With no wind pushing us backward, we did not need to hug the shore and were able to go out more towards the middle where there was a more obvious current. Glad to have functional rain protection for both us and the canoe today. We took a shore break and noticed a hose with water flowing from it. We had been told of springs along the Yukon and this appeared to be one. Took a break and noticed water coming out of a hose. We grabbed our droms and filled them up from the spring . Lots of flowers were enjoying the flowing water as well. We noticed a cemetery and soon the small village of Grayling appeared. It was a rainy, muddy day in Grayling. We still had plenty of daylight and decided to push on. Our maps are not always accurate and when an island appeared that wasn't marked we pulled in, checked it out .and were happy to be home. With no wind shaking our tent, no bugs dive bombing our tent and no rain falling, sleep was superb. The nights are getting longer as fall approaches and with an overcast morning I even at 5 o'clock had to use a head lamp to start breakfast. We were visited by a very curious snowshoe hare. His oversized feet were just beginning to show signs of turning white. 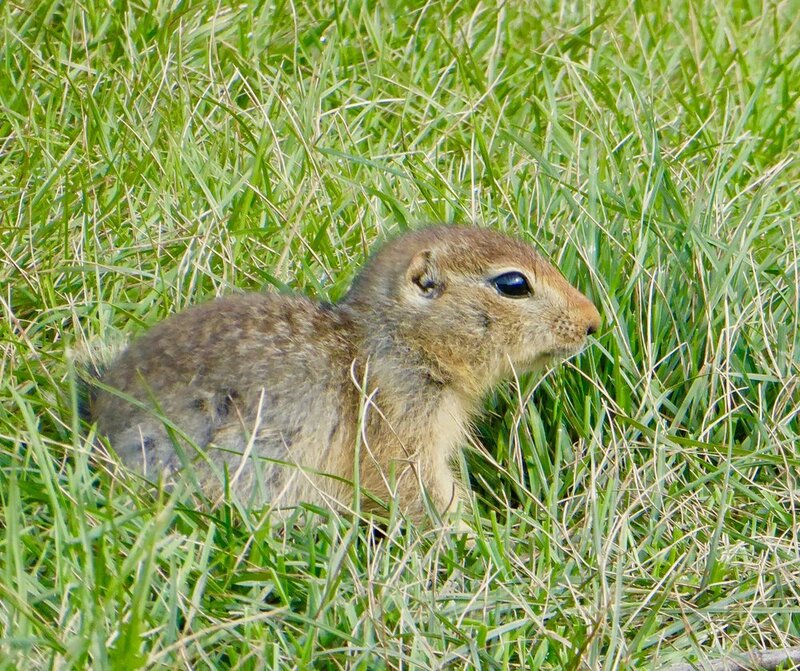 The hare was enjoying munching on the beach grass next to our tent. It was not as calm as yesterday, but still relatively good paddling conditions. We passed by more cliffs with falcons circling them. It was obvious that the young needed more landing practice as some attempts at landing were not successful. We had several choices to get to the next small villages. One was going thru a rather small slough. We thought it would be a nice contrast to the size of the river that we are now on. 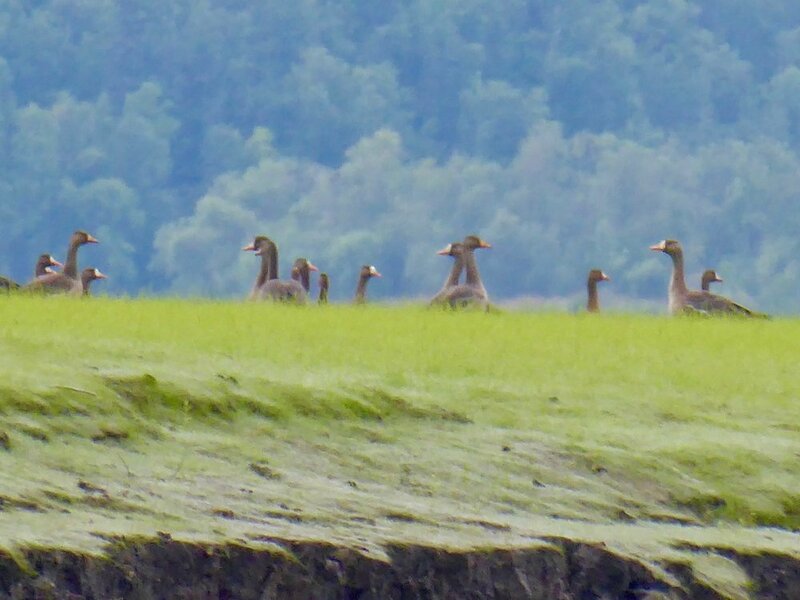 Not only were we enjoying the small size of the slough, but we came upon a large flock of White Fronted geese. Most flocks of geese fly the minute they see us. We were down below the bank and were able to get a good view before they took off. We are encountering more flocks of birds as we get closer to the coast. They all seem to be filling up on the grasses and it seems like they are practicing flying in formation. This will be the first trip south for the young so preparing for the long flight is most likely a necessity. We pass the mouth of the Anvik River which is clear and just a little bit upstream is the town of Anvik. As we pull into the shore a group of four men are getting off of a boat. They welcome us to the town of Anvik. We have some interesting conversations as they tell us a little bit about their lives here. Two of the men were born here and point out their birth house. They also tell us of some native lore and want to know if we have seen any of the little people that live in the woods. The man in the plaid shirt is from Nulato and ran the Iditarod in the 80's. He is here for a potlatch that is being held here for a memorial for his niece's baby. The two men to his right have lived here their entire lives.. The man to his left is from a distant village. We take a short walk up the bank. An old church and boarding school is boarded up. A new gazebo has been built near here. 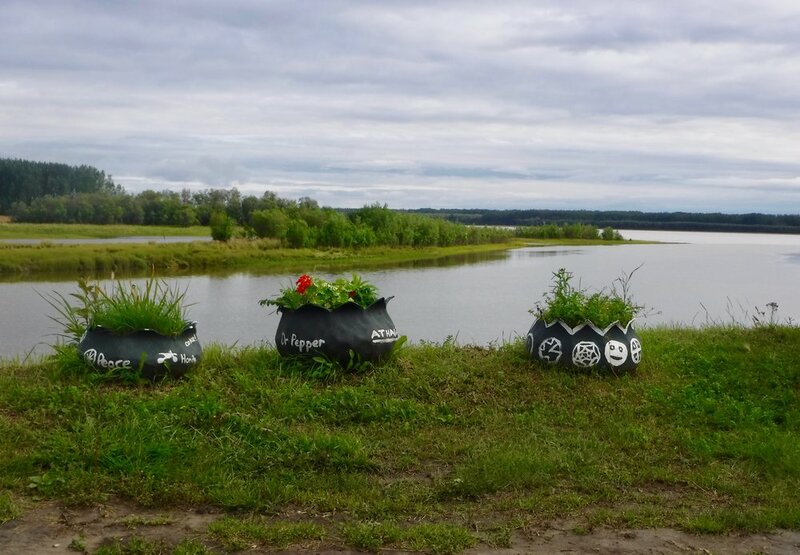 The use of old tires for flower pots is similar to the ones that we have seen in Mexico. Looking over the Anvik River. Time to paddle so we wave good by and spend the day enjoying the river. Camping sites are not as frequent here and we start searching around 5 to find one. Finally several hours later we see one that would probably work. It is on an island that is being eroded on both sides. We try to set our tent up in the middle and hope that there will still be land surrounding us in the morning. During dinner there is several loud splashes as the ground falls into the river. We go to sleep with one ear listening for approaching water. We were still surrounded by ground in the morning. I did get up once in the night to check our surroundings after several large chunks of land fell into the river. Today we are going to try to get water at Holy Cross. There is some wind, but hugging the shore allows us to get some protection. We see Dean's boat, the man we met in Anvik, he sends us a wave and speeds up the river. We pass a very neat and rustic dwelling. It is quite artistic in how it is built. Appears to have a nice garden as well. We take a channel that will take us to Holy Cross. There are several boats along the shore, but the village is not in sight. A man walking towards the shore tells Don where to find the washerteria and a small grocery store. Don heads down the road and the man who gave him directions then takes him to the two locations. Once again we feel quite welcome. he clerk at the grocery store lets Don use his internet and download some emails. As I wait with our boat, several men come by and talk. We get a little glimpse of what life is like here. A lot of time is spent hunting and gathering food. As the day continued the wind continued to die which we never mind. The clouds were fun to watch today. The most common shore bird that we see is a small sand piper. Unfortunately the bird never stays still long enough to take a photo. Generally it is found by itself moving rapidly along the shore. The other bird that we often see is the sea gull. Earlier in the trip when they were protecting their young we would often get dive-bombed by them as we went past the nesting areas. Several times we would have to put our paddles over our heads as they would come rather close. Later in the trip when their young were grown, it seems like they were doing it either to show their young or to have some excitement in their day. These immature gulls didn't seem to mind us as we passed by. We paddled into early evening. We are still averaging over 30 miles a day, but our day on the water is much longer than when we had the current of the upper Yukon. Today's camp is on the biggest sand bar yet. It is also our longest carry to where we want to place our tent. We are taking advantage of a log to keep our gear off of the sand. During the night we heard the sound of thunder and thought that a storm was headed our way. Fortunately it passed by without any rain or wind. It was overcast this morning as we headed out. It took awhile to get all of our gear down to the water. The water had come up a little, not sure if it is from the tide or from all the previous rain that had occurred. It will be something that we will watch when we set up camp. We passed by some steep mountains and marvel at the variety of the terrain that we are passing. We get around one mountain range and then there is one in the distance. Today the word is amazing wildlife. We were paddling close to the shore when a animal came down the bank. It did not look like something we had seen before. It was a small wolverine! We had surprised it and it crouched close to the ground where we could get a closer look. It almost looked like a small bear cub with beautiful fur of brown and black. The rounded ears helped to identify it as a wolverine. Shortly it was off and running and we were just left with a visual memory. Not much further and we saw a large black bear that looked like he was eating something on the shore. We were too far away for the bear to be concerned so the bear just kept on eating. When we paddle close to the shore any geese that are nearby take off in flight. They often circle and return to the same area that they had been eating. We never tire of seeing the flocks that seem to be getting larger by the day. The last mammal of the day was a slow moving porcupine. Nothing to fear for the slow moving animal as it turned its weaponry towards us. We pass more fish camps. At Holy Cross we were told that if we needed water just look for fish camps. Sure enough we notice that most of the camps have a water source nearby. It took awhile for us to finally find a campsite. The terrain was mostly a mud flat and we do not look forward to rain, if it occurs. The mud as it dried formed interesting patterns. A larger overview of the pattern. Tomorrow we plan on visiting Russian Mission. With a name like that one can see the influence of the early Russian explorers. We only saw one boat today and that was right before we found a place to camp. About five o'clock this morning the rain started falling and the wind blowing. We may not be going anywhere today. I decided to get up anyway and stuff my sleeping bag. We have down bags and are particularly careful about not getting them wet. If we stay and move in and out of the tent it would be difficult to keep them dry. I needed a flashlight to heat up water for hot drinks under the kitchen tarp. I have decided to embrace the sand, not much we can do about it except live in harmony and brush it away. It is a real skill to keep the sand out of the food. Since we were moving rather slowly this morning to see what the weather was going to do, I decided to take some photos of how plant life on the mud flats progresses. First tiny little plants with their leaves close to the ground begin to grow. 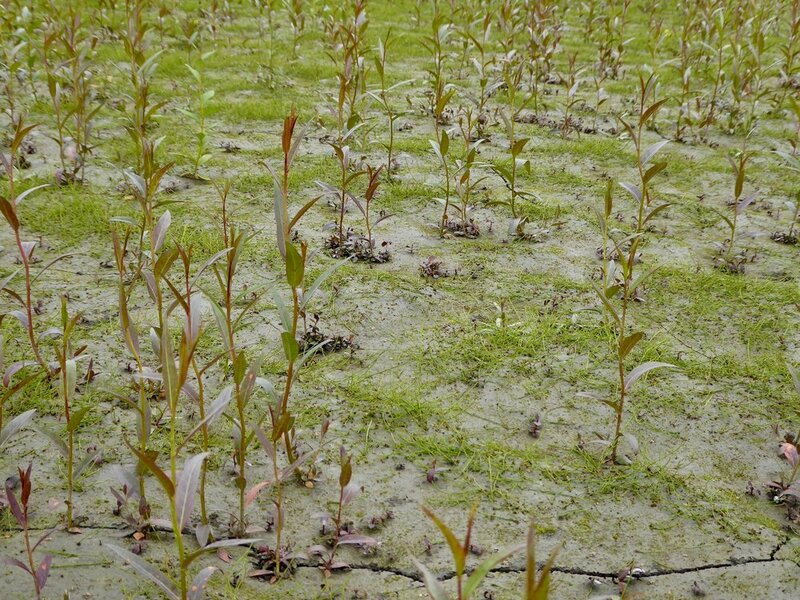 Next comes plants with longer stems and as one gets farther away from the water the stems get bigger. All this growth may continue or in many cases when the river changes courses it all gets washed away. The wind and rain have momentarily stopped so in our mode of moving when we can, we break down camp and head to Russian Mission. At Russian Mission, there is activity at the beach. Several boys are playing and they entertain me with life in the village. Both have been to Anchorage at least once. Another man is checking his nets for Silver Salmon. It has been a good day for getting fish. Don helps him carry his fish up towards his house before heading off to find a grocery store. Mathew and Dolores walk down to the beach and after welcoming us, tell us a bit about their lives. Mathew's great great grandfather was a pilot for the steamboats on the Yukon. 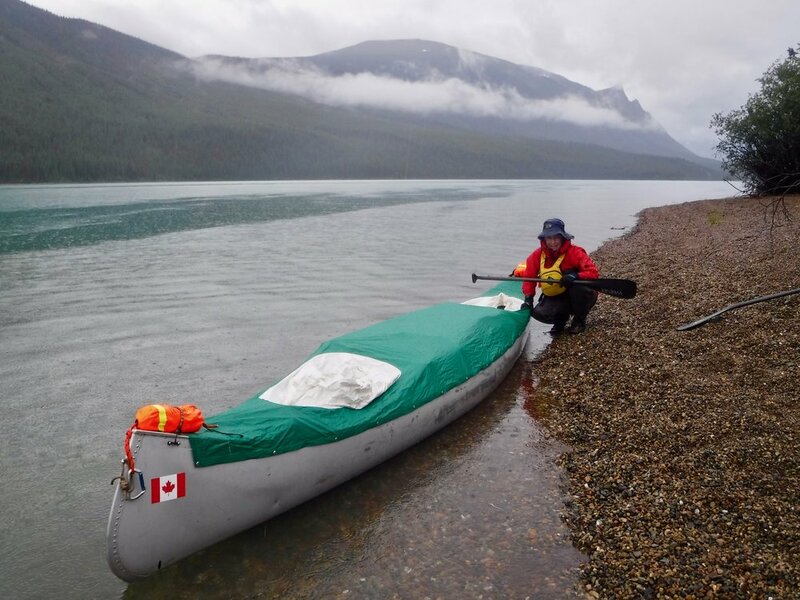 Mathew has retraced his journey on a boat going up the Yukon. Both Dolores and Mathew have lived in various towns in Alaska, but are glad to be living here. Dolores tells us of berry picking with the women in the mountains and Matthew tells us about his fish camp. Matthew tells us when the mist starts rising on the river in the morning, the silver salmon are on their way to their spawning grounds. This year has also been a good year for King Salmon. In fact this is the first time in six years that they have been able to keep King Salmon going up the river. We say our good-bys and head down the river. Tomorrow we will be heading to the southern most part of the Yukon then turning North to the Bering Sea. When we reach our camp for the night we discover that someone has had a nice meal. Only the beautiful feathers are left. The rain started about 4 this morning and was on and off till 6. As previously discovered wet sand is to be avoided at all costs. Don experimented with putting the tent on hard packed mud. This seemed to work okay, not sure if it would work in hard rain, but the amount of rain we got today seems to be fine. It took awhile to clean all the sand off our gear, but by the time we had done that the rain had stopped and the wind had quieted some. A fox was the first animal of the day. It ran along the shore for quite a ways. Today we will be heading south, then we will be rounding the most southern point of the Yukon before heading North. One of the books that we have been reading about this section warns of winds that can develop here as well as strong currents that can occur. The river gets divided into 3 channels and one is to be avoided. Matthew from Russian Mission warned us about the current. We are excited about the new direction that the the river takes. Once around the point we pull into shore and plan to explore an abandoned fishing village from over 200 years ago. This was a village that had Russian influence. Several of the cabins have mostly fallen down. We look in one building that is still standing . We try to interpret the items inside. There is a huge stack of paper dishes, several bells and miscellaneous items. It looks like an animal has made a mess of the inside. This large bell sits on a table next to a smaller engraved bell. There are some older graves around the back of the church, but there is a well maintained one right near the church. Seems like it was freshly painted white with red flowers. The door to the church is opened and it is nothing like the cabin. One could almost imagine that within recent time a service had occurred here. Since photos can tell a lot, below one can see items that we saw in the building. There were several hymnal type books along with the below two written pages. Putting together some of the clues in the building, perhaps there was a potlatch done here to celebrate the death of one of the elders or priests. We head back to the canoe trying to visualize what it would have been like to live here many years ago. The silver salmon are jumping and the geese are continuing to fly overhead. Fall is approaching. A porcupine waddles along the shore. It seems as soon as they see us they turn their quills toward us. They have no worries we will not get close! We start looking for home tonight and decide to stop at a very large mudflat. It probably goes on for miles. We have discovered that hard mud is a good surface to set the tent on. Tomorrow we should be stopping at the town of Marshall. Several boats have gone by our camp tonight, indicating the village is close. About 3 in the morning the wind begins to blow and the rain starts falling. It is hard to return to sleep as the wind and rain pelt our tent. We are in the midst of a large mudflat and there is no wind protection. Finally around 5 I decide that it is time to get up and when I look outside the stars are shining brightly. I head over to the tarp to make hot drinks and to start breakfast. As the morning light begins to brighten the landscape a large bull moose ambles by our campsite. He seems to be enjoying an early morning stroll. The wind is still blowing, but there are several small channels that we can take to Marshall. If we work our way up the shoreline we should be able to get some protection. It definitely helps! We scare a cow moose and her calf as they are swimming across a small outlet of the river. They quickly reverse their path and head back to the direction they came. There are beautiful hills surrounding the village. At one time in history there was a gold mine here. It looks like there might be good berry picking up on the hill aways, but the approach would take most of the day. When we reach the village there is a lot of activity going on as boats are being prepared for fishing . Don heads up to find water and perhaps a grocery store. He has success with water, but not so with the store. Most of the fishing here is done with drift nets. It is interesting to see the different types of boats that are used in the villages as we go downstream and get closer to the ocean. A man pulls into the shore and comes over to talk to us. His name is Charlie T and he welcomes us to Marshall. He is excited for the opener today and wishes he had a fish to give us. He tells us of a shortcut to get to Pilot Station, however he is not sure where it is on our map and tries to describe it to us. He warns us of the North Wind that makes this next section dangerous. This time as we leave town the cemetery is below it. The wind never really calms today and since we are hugging the shore, it is unlikely that will be going to an island This will be one of the few times that we will camp on the main land. There is only space for our tent right next to the willows. Not ideal but the only option is the one we take. At least we have good wind protection. It had been awhile since we slept on the mainland. It was also the first time that we did not have an area round the tent for animals to walk around us. I was awakened by footsteps approaching our tent, a hiss and then an animal crashing thru the woods. It was hard to determine the size, but I was glad that it was running away from our tent. Not particularly fond of night animal encounters. The next morning tracks in the mud were more fox size. Sure sounded a lot larger! It was also the end of an opener and fishing boats were going up and down the river delivering their fish catches to a processor in one of the next villages. Then there was the northern lights and full moon. In other words it was not a good night for sleeping. When we finally did get up it was around 6. One of our later wake ups. There was a very heavy dew which also slows us down. The day was overcast with wind and rain. Sometimes quite hard. We looked for the shortcut that Charlie T had told us about. The current in a small channel was going in the direction we wanted to go, plus it was a lot smaller than the main channel. If it worked we would be out of the wind. Thinking that we should give it a try we headed down the slough. It was quite pleasant, and when 3 owls flew in front of us and several beavers were working at their huts, we enjoyed it even more. Then the slough split and it just didn't seem right. We pulled out the navionics app and it showed us going on a very long meandering channel. Eventually we would end up where we wanted to go, but it would not be a short cut. Not really wanting to but knew that we had to, we back tracked and worked our way up stream, back to the main channel. We had to ferry back and forth which even added more miles to the day. When we got out to the main channel, the wind was against us and the rain was pouring. We decided that it was not worth stopping to camp, and that we would be warmer in the boat. We watched rain squalls heading our way and usually would get the brunt of them. We finally saw the village of Pilot Station in the distance. Decided not to stop as it was rather late in the day and the weather was beginning to clear. There were lots of nets on the shore as we paddled by the village. Some nets were lined out very neatly, others just piled. It would have been interesting to be here during an opener. There is a tidal influence here and the first site we checked out would be underwater at high tide. Finally found a gravel beach that we could make a platform to put our tent on. It took some work, but home was made and a couple of tired paddlers headed to bed. First though we were gifted with a rainbow in the sky. I decided that listening for animals in the night was not worth the effort and quickly fell into a deep sleep. It was a wet night and trying to get small pieces of gravel off the bottom of the tent was challenging. Fortunately the rain had stopped and there was sun and wind. Slowly our gear got dried and we were able to pack it up. The wind is blowing and the waves are descent size in the middle of the river. We are only able to travel by hugging the shore and going between islands. There is a channel that parallels the main channel and if we can get to it we should be able to get closer to our destination. We heard a boat and then saw it coming out of the channel. We were soon heading up the channel with visions of St. Mary's as our destination. These visions were soon crushed as we approached the end of the channel. In the distance we could see sand blowing across the water and the waves were higher than what we wanted to paddle in. It looks like we might be stopping sooner than we thought. Blowing sand is not a good sign. Looks like a path leads up to a small clearing large enough for our tent. We set up camp, perhaps the wind will die and we can paddle later this afternoon. Don crashes and when the wind doesn't die down we make the site our permanent home. Don sleeps and I take a little walk , which ends up rather short as the terrain is overgrown grass with lots of logs. I decide that a sprained ankle at this stage in the trip is not worth it. Sleep is good! This is one of the shortest paddles of the trip. The beavers were quite active last night and the wind continued to blow hard. Not a good night for sleeping till about 4 when one could sense the wind had calmed. I was ready to get up, but it was still dark at 6. The seasons are changing. Last night we could see the lights of Pitkas Point. For some reason we were able to get cell service. It was enough to load emails and get an idea of when the eclipse was going to occur. It would only be a partial one, but still we would be aware that it was happening. It was very foggy this morning. We could not see the other side of the river. We also decided that we were not going to visit St. Marys. It would have added 6 miles to our journey 3 of which would have been paddling up the Andreafsky River. Today was starting out with flat water conditions and we wanted to take advantages of it. We started out by hugging the shore as that was the only thing we could see. We eventually realized that we were crossing the Andreafsky River. 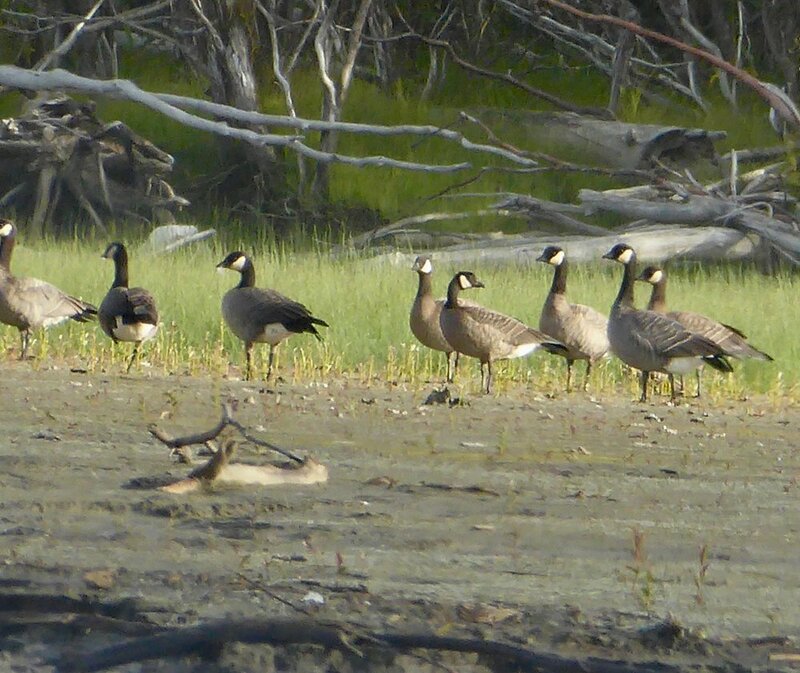 The fog was lifting and Canada geese were hanging out on the shore. As the fog lifted we could see some blue sky overhead and clouds were going back and forth in front of the sun. Perhaps just perhaps we could get a photo of the partial eclipse. I pointed the camera at the sun behind our backs and took some shots. Third Photo. The skies were definitely lighter so perhaps we were part of the eclipse frenzy! Today we saw our first large flock of Sandhill cranes flying overhead. Their vocal noice is easily identified. As we were approaching Mountain Village we saw lots of nets on the shore as well as numerous fish camps. When we saw a cemetery up on a hill we knew that we were approaching Mountain Village. As we pulled into the village, Martin, a man from the village, walked down to greet us. He told Don where to go for groceries and where to get water. As I waited on shore several men came up to talk to me as well. They were curious about what we were doing. They also said that the fish processor had free fish if we wanted one. The fish had just been caught. Our partially sunny morning had now turned to rain and the wind was starting to blow. When Don returned from the town , he was carrying empty droms. and some of the best grocery food yet. Several people had told Don about a spring just outside of town and that the people living here all get their water here. We loaded up and headed to the spring. When we arrived someone was getting water there as well. So much better than the treated water. There was some wind blowing and we had to make the decision to cross or not. The place we wanted to cross had numerous islands which would provide us protection from the north wind. We decided to go for it and made our way to the other side. The challenge now was where to camp. We didn't have any options for quite a ways. There was a channel that we could take tomorrow that parallels the main current. We had not planned going to where it started, but there was not any suitable camping so when we arrived to the channel, we were relieved to see a suitable camp spot. We finished setting up camp in the dark. Hat made by our son Jeff. The slough or channel feels like a whole different world than what we have paddled recently. It seems strange to easily see both sides. Before we were in the channel the river was often 3 to 4 miles wide. Now early in the day it can be measured by yards.. A cow moose is spooked as we start out and then just a little later we are being observed by a young bull moose. Hunting season is coming soon and this moose could be in trouble if it doesn't take off when it sees boaters. It seemed today was a day of inward reflection. Tomorrow if all goes as planned we may be in Emmonak, the end of the journey. The channel finally joins the main river and we can see why so many people warned us to get off the water if the wind picks up. We feel like we are on the ocean. As we look to the North all we see is open water. More boats are on the water than we have seen the whole trip. Most wave if they are close enough. Others look tiny as they hug the opposite shore. There must have been a fish opener. We are not sure where we are going to end up today. At Mountain village we had gotten a weather forecast predicting that a wind storm was coming day after tomorrow. If that is accurate we need to paddle as far as we can get. Our direction turns westward which is a good identification of where we are. 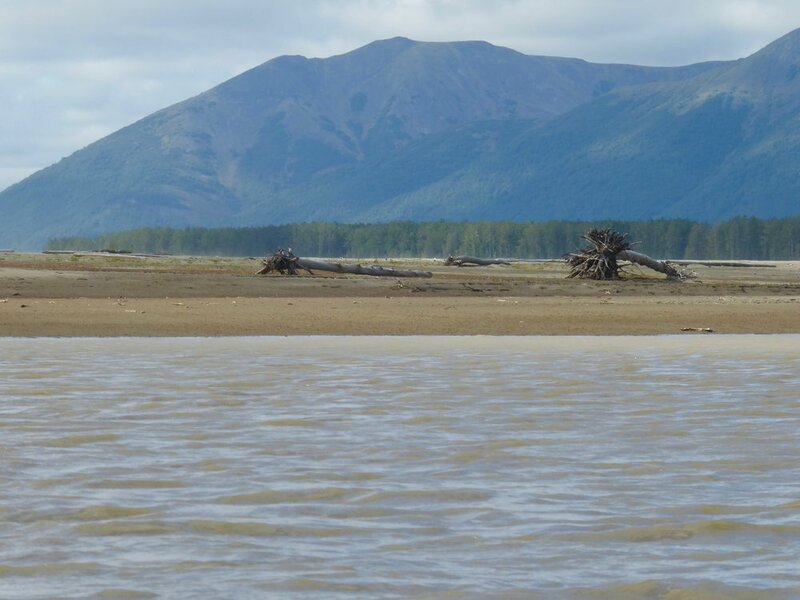 We start running into numerous sandbars and realize that the tide will be a factor in where we can camp. The wind is blowing steadily, but we feel that we can safely cross to the other side which is where Emmonak is located. We pull out our navionics app when we reach the other side. We are about 7 miles from the village. It shows us approaching land, but that is not the case as we have a ways to go before we can get around an island. The Yukon deposits so much sand in this area that the channels are continually changing. Finally as the light begins to fade, we find a small piece of ground that is above the high tide line. We eat some cold food and call it supper. The gnats are the worst of the trip so we quickly retreat to the tent and are glad that this day is over. We paddled for over 12 hours today. It has been a long day. 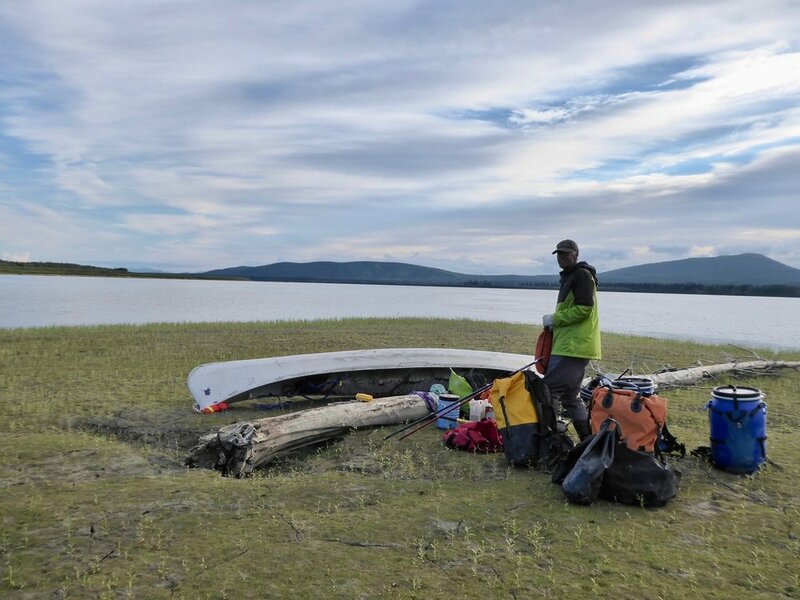 Tomorrow may be our last day of paddling on the Yukon. Fortunately when we got out of out tent this morning, the gnats were too cold to annoy us. We ate a quick breakfast and headed toward the village. So thankful that we had put in a long day of paddling yesterday and had crossed the river to this side. The wind was beginning to pick up, but did not have much effect on us. In the distance we saw the wind generators, another indication that the wind is a frequent element here. Lots of the villages on the coast utilize the wind for their power. The first building that we saw was the fish processor. Now it made sense why we saw so many boats yesterday. When we were here, it operated around the clock. The silence of the Yukon was gone. 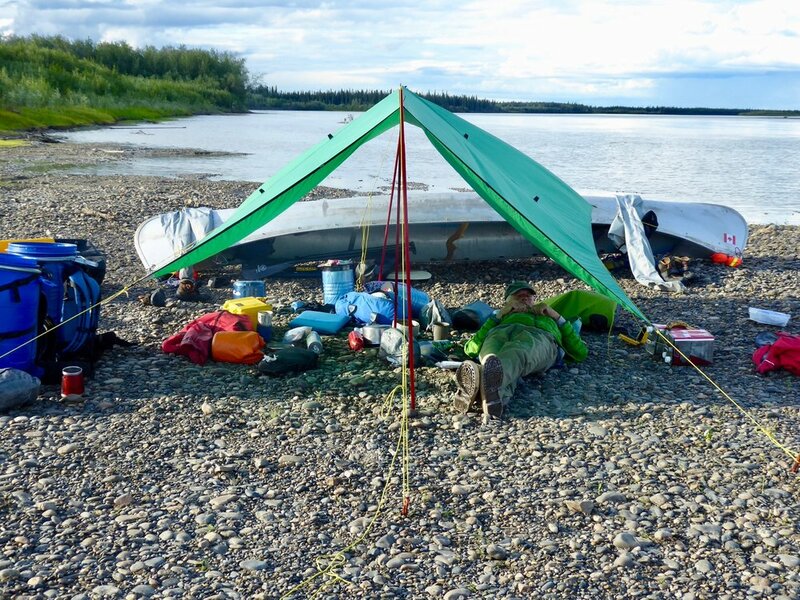 We headed past the processing plant and saw a tent and canoe on the shore. We soon were welcomed to Emmonak by Quintin and Sarah. 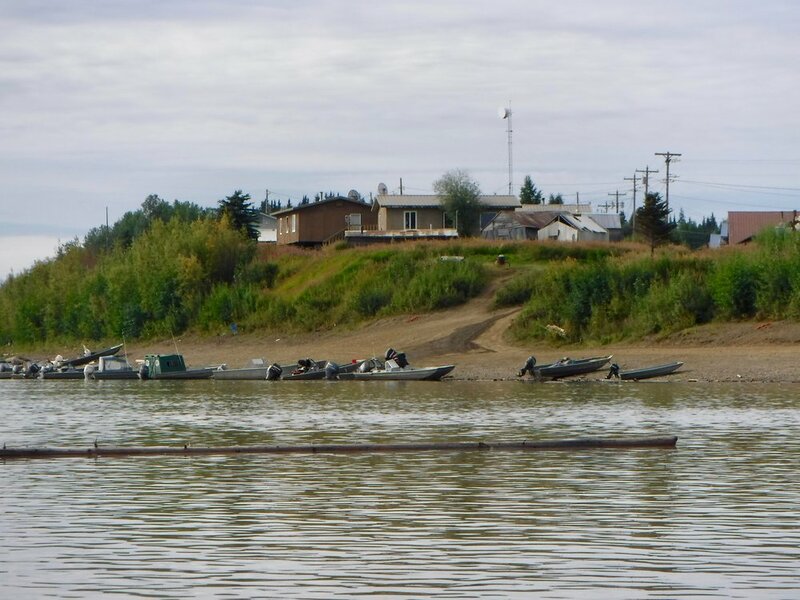 They had also paddled the length of the Yukon arriving yesterday. Their journey was a month longer than us as they spent longer times in the towns, plus had conditions which prevented them from moving. It seemed like we must have been in the right locations when the storms hit. Having tea with our canoeing neighbors. As we were setting up camp, numerous folks came by on their four wheelers to welcome us and ask us if we had anything for sale.. When we started our paddle, we were unsure of what we were going to do with our canoe at the end of the trip. Several sources that we had read commented that the villages here have boats sitting in their yards from paddlers. Some have been abandoned. Our canoe was not sleek, lightweight or shiny, but we had come to appreciate its durability. 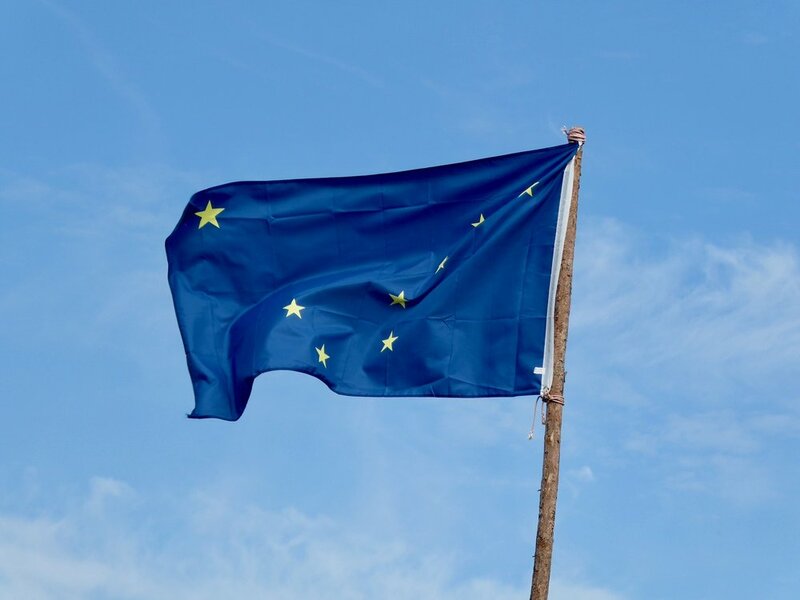 We thought that we would pursue what it would cost to ship it back to Anchorage. We soon found our answer from Quintin. It was way reasonable! 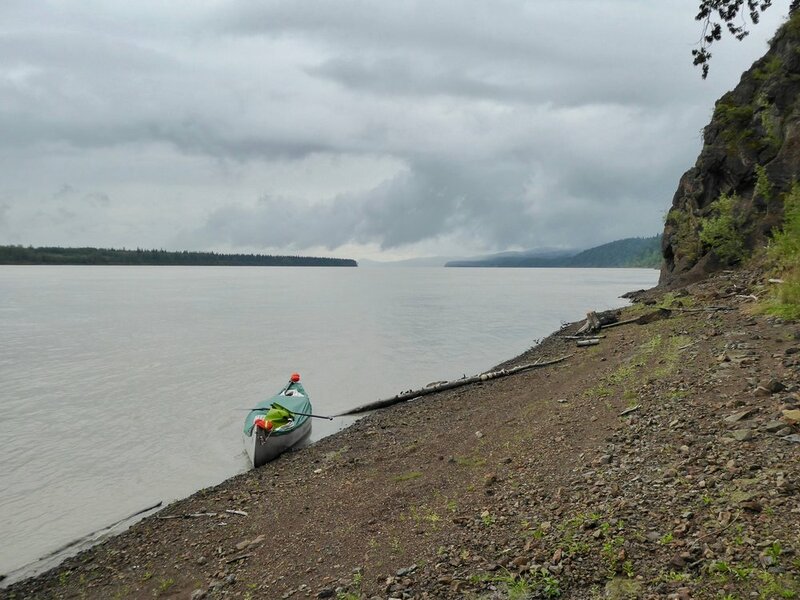 Everts Air, a cargo business would take our canoe back to anchorage for 30 cents a pound. It did not matter the size ,so for less than 25 dollars our boat was heading south. It also seemed that we could have sold it for a good price as well. Don hitched out to the airport to confirm this information. The folks at Evert Air suggested that we find someone at the fish processor to truck our boat out to the airport. Now we had to figure out how we were going to get back to Anchorage. We had not purchased a ticket due to the uncertainty of our ending date. The soonest option was leaving in two days flying on Grant Aviation to Bethel then Alaska Airlines to Anchorage. We booked the flight and will plan on enjoying our first no paddle day tomorrow. We know we are quite close to the Bering Sea when a large barge pulls in to the processor. The barges on the upper Yukon are quite small when compared to this one. A man called Bart stops by to visit. It is an interesting conversation. He plans on returning with some fresh moose meat. A little later he returns with warm moose meat and several of his children. 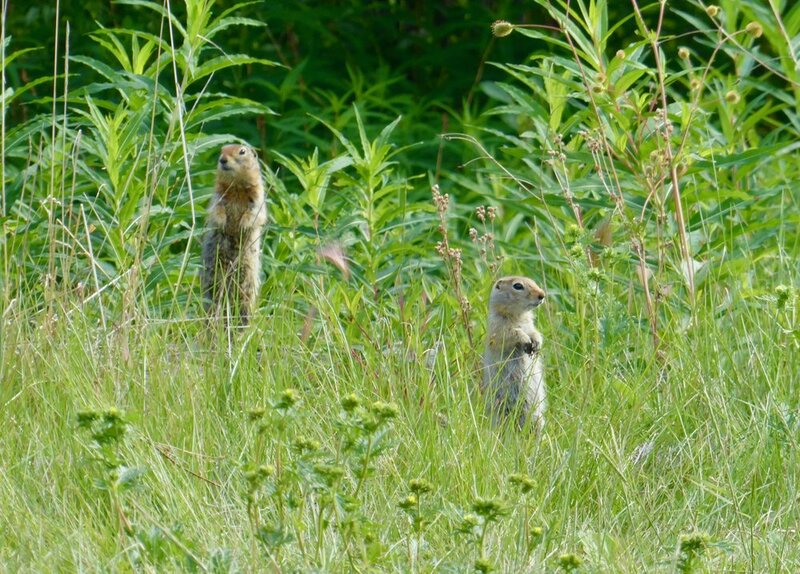 We give them some of our trail mix which they appreciate. Bart and several of his children. We spend the rest of the day drinking tea and sharing stories with Quitin and Sarah. Tomorrow will the first day since we started our paddle that we will not be canoeing. It is a good feeling to be here. Don celebrates his 67th birthday with some ice cream from the Alaska Commercial store. There was a good selection of food items here. The best since we left Dawson. Our last full day in Emmonak, was a slow to rise day as the main goals today were to take showers, do laundry and repack our gear to send it back to Anchorage. Grant Aviation allows us to take 100 pounds of gear with us, but won't guarantee that we will be able to take it. It all depends who and what is on the plane. With that knowledge we decided to send 100 pounds of gear back with our canoe. So once again we find ourselves repackaging our packs. We are grateful that the rain is holding off. The wind has been blowing quite strong. We had tentatively planned to take a boat ride to the mouth of the river, but due to wind it was canceled. Seeing it from the air tomorrow will have to suffice. We head up to the laundry, shower building and check off some of our main goals for the day. A wind generator near the town eliminates silence. We enjoyed seeing the street signs. The Yukon has several main channels that flow into the Bering Sea. Emmonak is on the Kwiguk one. 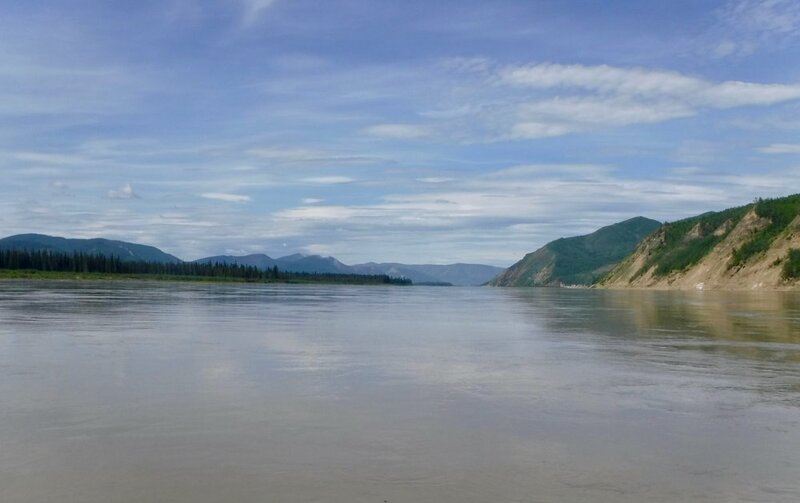 The end of the Yukon is called the Delta. Sarah had gotten up early to check out where the Fish and Game was located. They do tests on the fish they net and will give away the tested fish. She was successful in obtaining a very beautiful silver salmon so we combined our food and had our own potlatch. Several more visitors came by to say Hi. Bart stops by with a thermos of coffee, Emmonak is a very friendly town. Not much to do tonight so we head to our tent and gear our thoughts towards the life of cars, people and home. Our home while in Emmonak. Waking up with sunshine and wind was a relief .Can't say that it was a quiet night. The wind generators were spinning, the beach was filled with noisy people and the fishing processor was quite loud. What a contrast to our previous nights. Our plane leaves early afternoon and we will be able to get our tent and tarp dry. We share some coffee and tea with the neighbors and finish up the packing. Don finds a truck to take our canoe and packs to the cargo hangar. When he returns we take our end of trip photo. We are both ready to let our arms rest up some. We head off walking to the airport each carrying a canoe barrel and paddles. We are quickly offered a ride to the airport. It was a good thing that we are sending some of our packs with the canoe. The plane is full and there is only room for the gear we are carrying. The eight seater plane will take us to Bethel. There is so much water! The sun goes down and soon we see the lights of Anchorage. Two hours later we are back home. Time to go to bed!